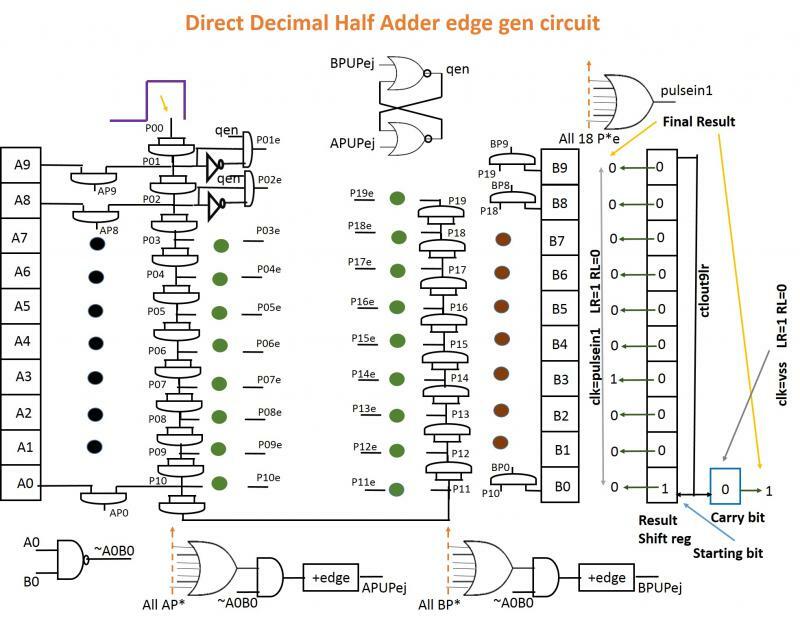 Obvoulsy, this full Adder works in half Adder time plus another two edges for the carry adds - much faster than the sequential mode (Item#304). 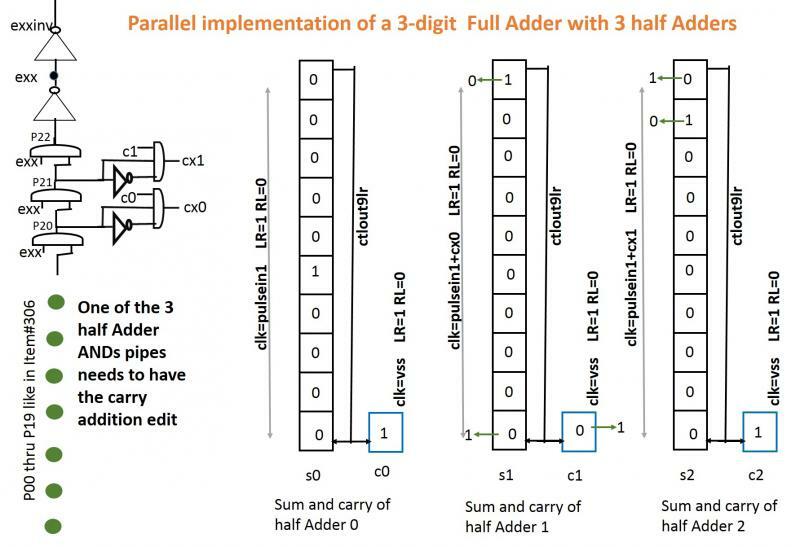 From this example, one can estimate that a 10-digit direct decimal adder will work in one and half times the time taken by a half Adder, when 10 half Adders run in parallel as in the scheme shown above. The edge A which is the clk rising edge is used to read in the spice input data into the left and right add data registers. The edge B which is delayed edge A makes the carry add to the left column when previous carry is 1. The edge C which is the delayed edge B, initializes the sum register's 0 bit to 1, and the carry bit to 0 - it also starts a latch that initiates the half adder action. On the cycle ending side, the exx dip D is used to clean up the trailing ends of the moving pulse inside the ANDs pipe. It also helps generate the edges E, F at its rising and falling. E is used to reset the left and right add registers, F is used to reset the sum register but not the carry bit. E, F also define a latch opening to output the sum results of the preceding add - see V(fa*) in Item#304. 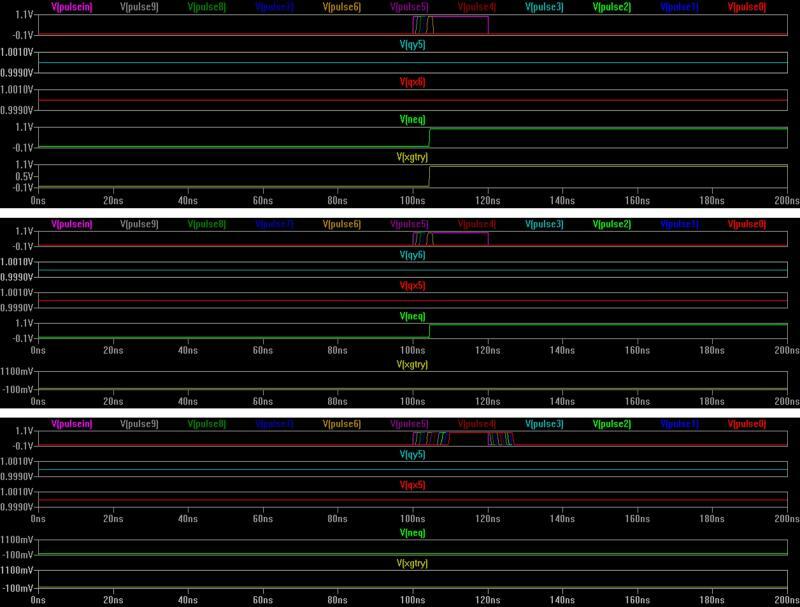 Two cases are shown below - spice data input, followed by the simulation results. In the simulation results, the left most pane shows the 13ns clock used, the next pane shows the transferred contents of the left column addendum, with carry related shifts if/when it occurs, the third pane shows the transferred contents of the right column addendum, the next pane shows the FullAdder sum digits as output after each digit add, the fifth column shows the carry bit movements, the sixth shows the result register shifts. Please, note that the final result includes the Sum digits preceded by the final state of the carry bit. Obviusly, in this scheme, each sum digit is extracted every clock cycle, and the adder is recursively used for the next, and so on. The advantage is that only one adder is needed for this scheme, but the time taken to add multiple digits is number of digits times the clock period. A parallel scheme can be configured where multiple adders work simultaneously to add multiple digits in one clock period - fast, but needs more circuitry. An example position of the sum and carry registers shown for a case where 7-4=3. Note that the ctlout9lr is entered into the carry in such a way that it unsets on receiving a 0 edge, as opposed to set in the half adder case. The difference in connection to the wavefront sensing AND gates on the right side (BP*) with respect to the left side (AP*) is to account for the fact that the time to update the 'qen' state is slower than the generation of the P*e edges. This can be seen by tracing the respective circuits. 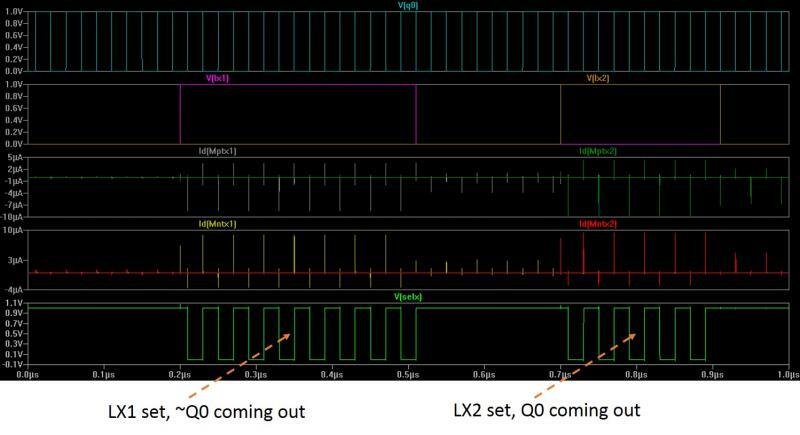 The half adder shows the advantage of using the advancing waveform scheme of Item#265 (qx>qy?) 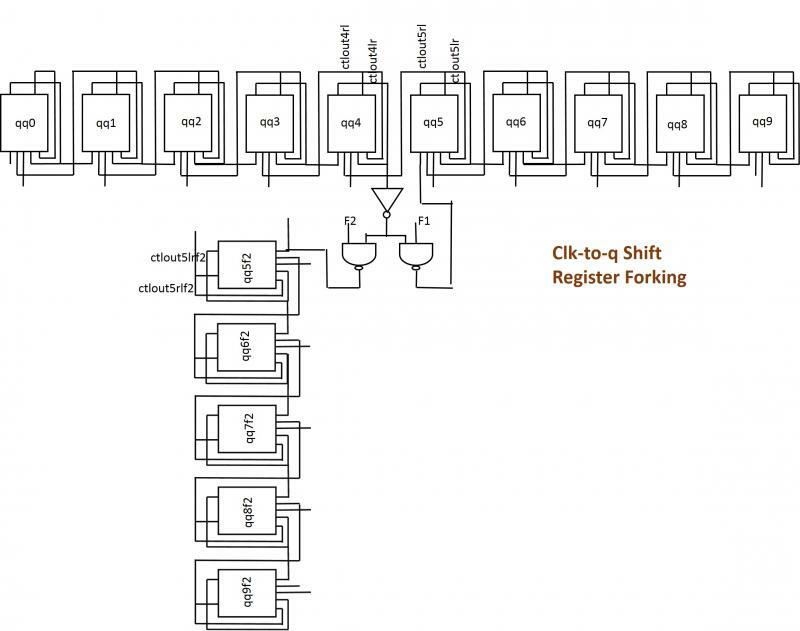 along with the clk-to-q bi-directional shift register that provides speed and miniaturization. The underlying principle being the edge based design methodology. The good thing about the edges is that they quickly accomplish a task and vanish, they don't linger - avoiding interference with other entities in time. The energy of an edge is given by VxIxdelta-t - since V is constant, the energy can always be adjusted with I and/or delta-t. The left-most pane shows the advancing waveform introduced as a pulse in top left of the schematic of Item#298, through the series of AND gates. The second pane from the left shows the edges output when the latch is set (qen=1). Please, note that the p01e, p02e, p03e, etc. are same el9, el8, el7 ... of Item#298, taken in a monotonic sequence. The third pane shows the ORing of the edges p* to create the clk sequence pulsein1. Exactly the same number of clk edges are produced, as the sum of the two addenda. 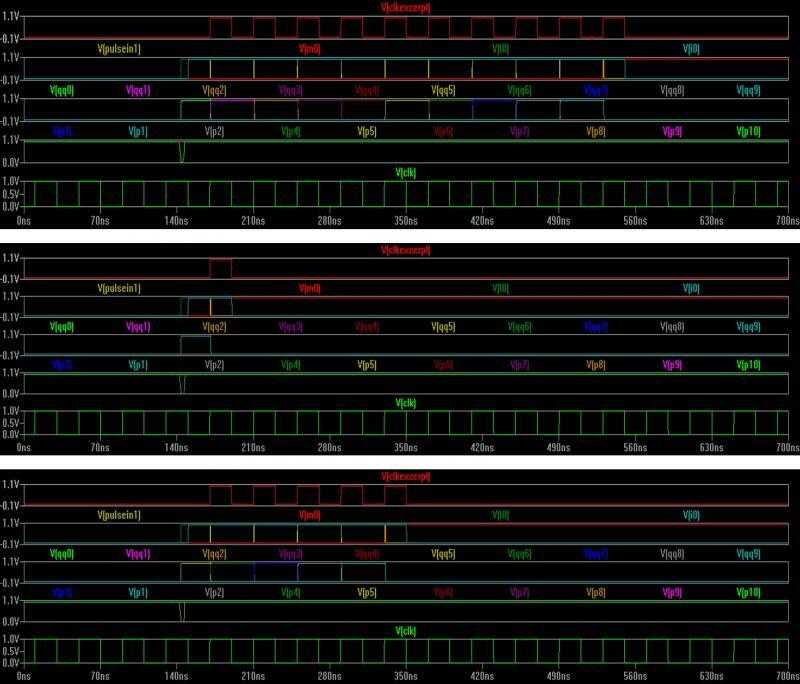 These clk edges (high frequency) drive the result shift register and carry bit, as shown in panes 4 & 5. The multiple (20) edges (top pane) are getting extracted out of a 20ns pulse (P00). The the pulse edges correspond to a frequency of about 1.67GHz. So, we are pushing the shift register operation to the limit - but, still it can be made to work (bottom pane). 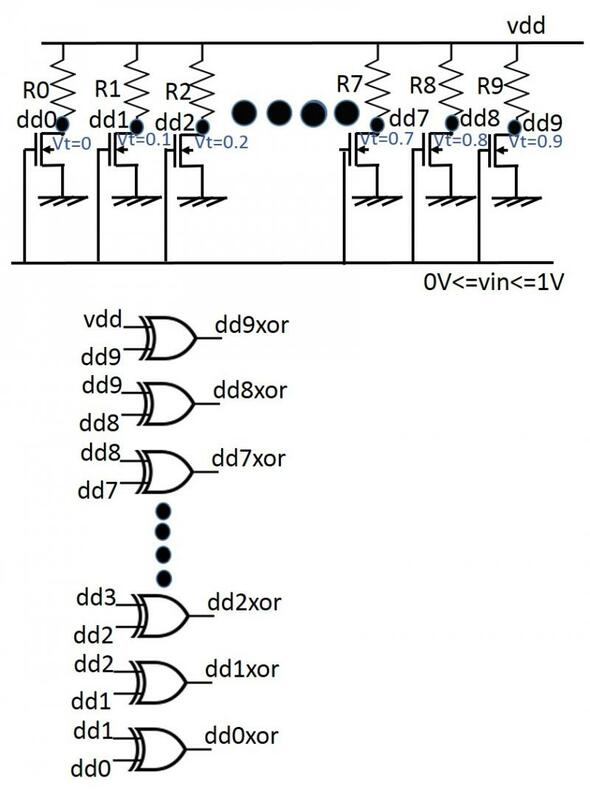 The 20 stages of the shift register are pulsed through in about 12ns. P00 is advancing through a series of AND gates as in Item#265, and a +edge extractor at each stage gets the edges out. The bottom panel shows the case where no 'shft' edge was received by the SEN latch - so no duplication of the first pulse occurs. This is the un-shft-ed case. 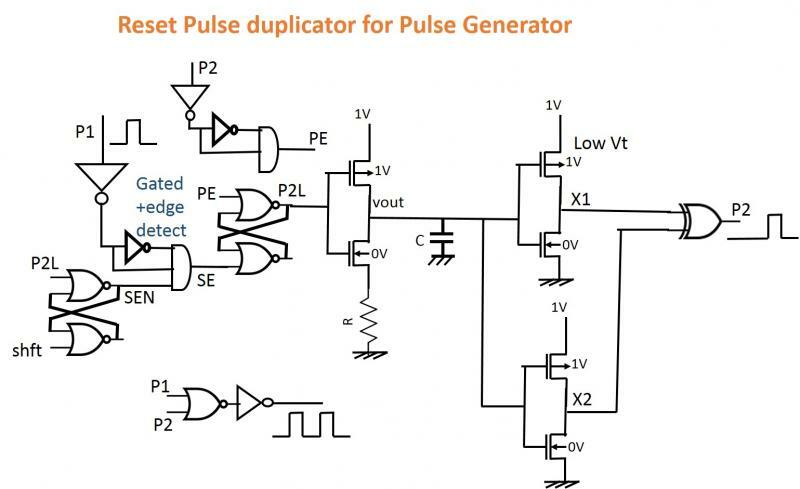 One reset pulse (P1) generated by the pgen's inherent reset generator (see, for example, Item#286) gets duplicated to (P1 OR P2) when the SEN is high. The SEN is activated by a pulse 'shft' which needs to be generated by the shft-ed pgen's input circuitry when shft+Number are pressed. Note the additional input terminal LC to the LCX generating AND gate (top right). This is needed to suppress an unwated LCX edge right after UCX falls to 0. 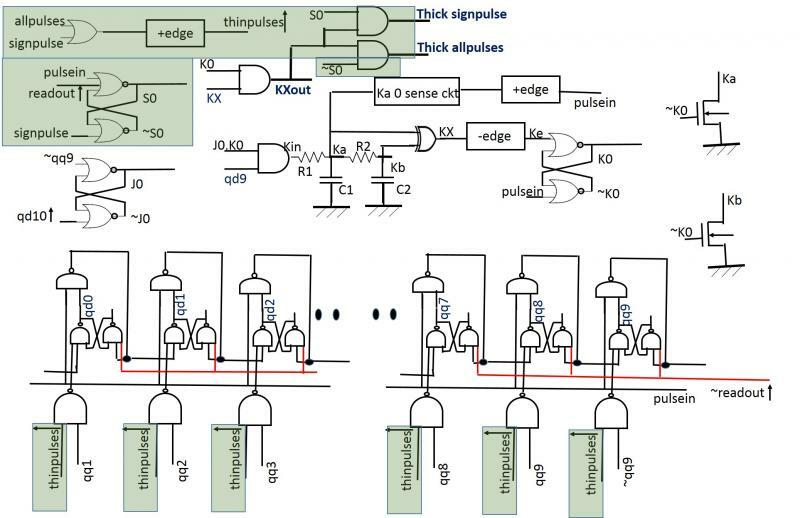 Interestingly, the method can be generalized to a standalone pulse counter, by increasing the delay time and adding more latches. 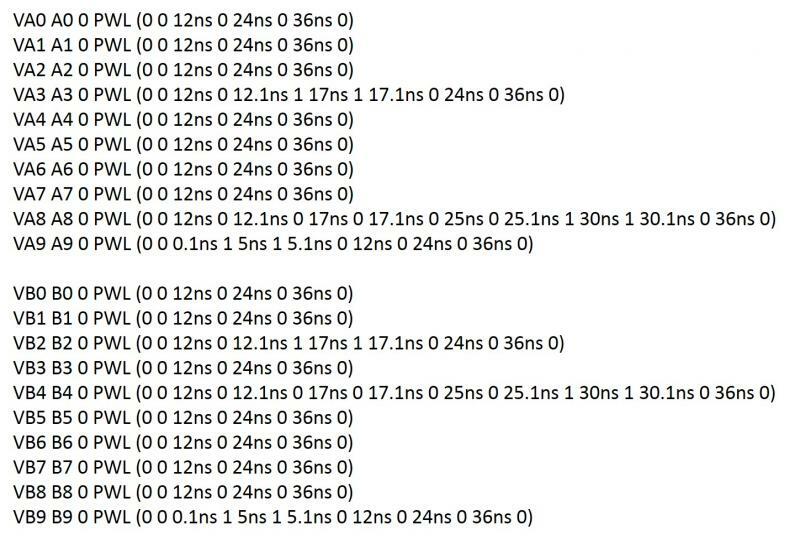 Please, also note the ~1.4ns delay of FR with respect to LC unsetting by Z. This ensures ~FR remains 0 when the final (end of monitoring) reset pulse's +edge comes in - protecting the latches from any conflicting inputs. As indicated in Item#285, 100fF corresponds to 2.284x2.284 um^2 of gate cap - so, 350fF would be 8umx2.284um of gate cap. While a 100K resistor can be realized by a 50 squares long nwell resistor with 2K/square sheet rho. Or, through a mildly subthreshold nfet biased appropriately. The resistor and the nfet above it dissipates a few uW of power roughly for the duration of time the capacitor discharges to 0. After that there is no dissipation during the rest of the monitoring time, although LC remains at 1 for the entire time (delay + monitoring). Note in the following panel that if a typical longer monitoring time is chosen, the integral of V(vout).I(Rxx).dt is negligible when divided by the entire cycle time. The changes with respect to the circuit of Item#288 are marked in yellow. Please, note the little timer involving the capacitor C, and the inverter to its left. The timer can expect one or two pulses (see Item#289) within a small time interval, say 70ns. If there is just one pulse coming in, the lower latch (LC) is set, if there are two pulses coming in, both latches (LC,UC) are set. When C discharges to a low value, FR goes to 1, and looks for the states of LC, UC, and accordingly generates the lower case (LCX) and the upper case (UCX) selectors used in the transmission gates at the bottom. FR initiates monitoring as usual. The reset pulse Z is being used to unset the latches (LC, UC) at the end of the cycle, when the final reset pulse is received. One thing is obvious from the use of the reset pulses in the vmon - they are serving as commands to the system, and the clk pulses as the data, both tramsmitted on the same channel. 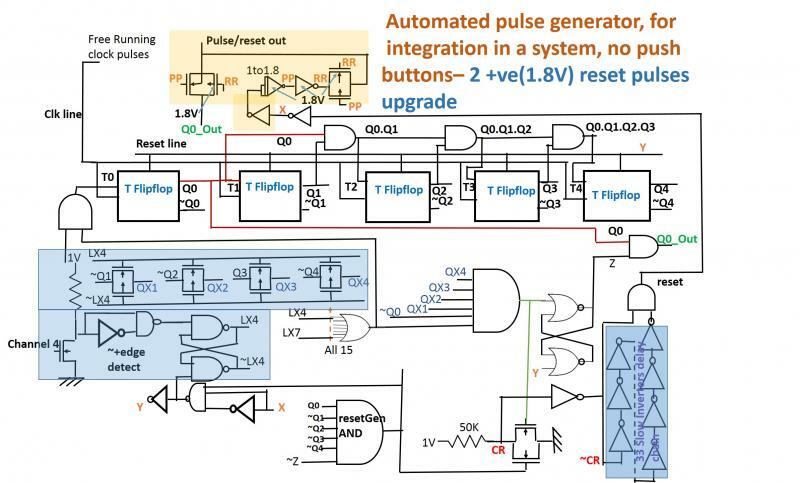 For example, if we allow the first reset pulse to be a pair of two reset pulses, that is, you can send either one or two pulses right at the end of the clk pulses, we can let the single pulse open 15 separate transmission gates, while the pair open another 15 transmission gates. This is comparable to a 'shfted' operation of the vmon - where, sending a pair means pressing the 'shft' button after the clk pulses. Please, notice the small change in the yellow marked region near top left. The pulse height sensor of Item#287 has been represented by a special symbol. The AND gate at the top thickens the dip in vout, to create a thicker dip (X) that prevents the reset pulses from entering the clk line, ANDs them off. As was the case with the vmon of Item#229, the input to the inverter to the left of the +edge detect circuit needs to be a 1 to 0 dip for the reset pulses (at the vout node above), and the input to the clk line needs no other positive pulses than just the clk pulses coming from the pgen. In the case of Item#229, negative reset pulses were allowed into the clk line, as they would not move anything. But, in this case, the positive reset pulses needed to be cleaned up, before they could enter the clk line. Note the small changes in the pulses output circuit - marked in yellow at he top. 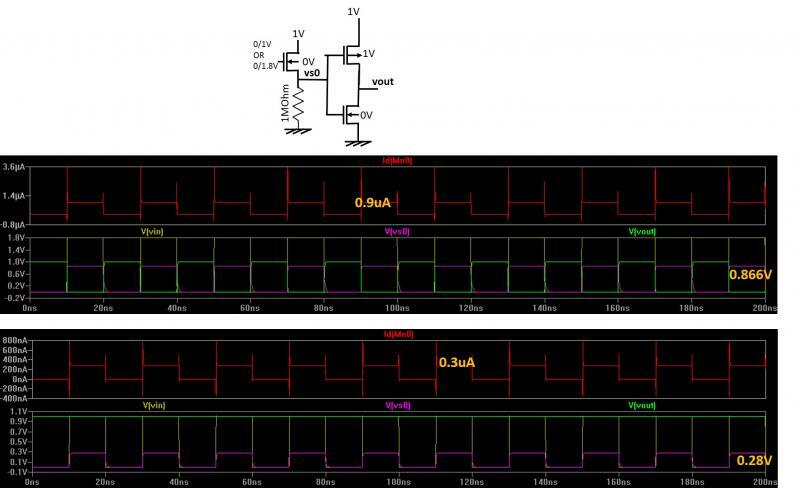 While an 1.8V supply is needed, no deep nwell or capacitor is necessary. The level shifter is indicated by a special symbol. Please, note in the following annotated circuit diagram that the Mn1 fet does not figure in the charging or discharging paths for the output capacitor. 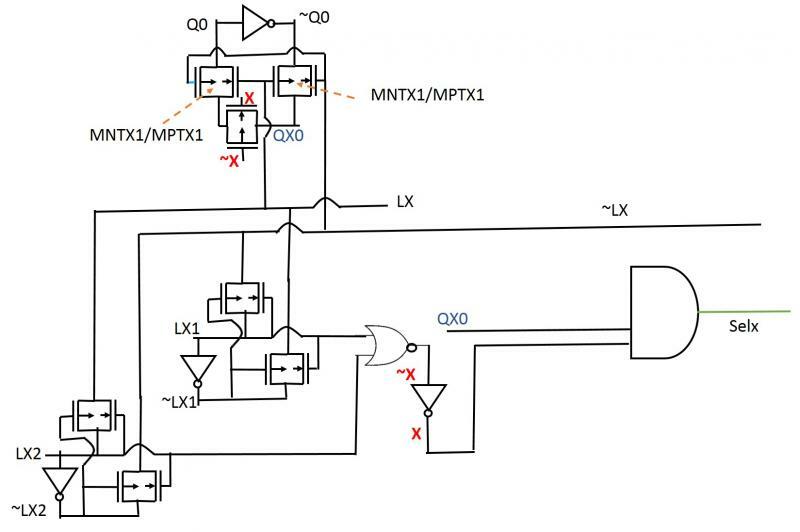 Its function is only to provide a leakage path so that the Mp0 fet can remain off during vout=0. Otherwise, vout would not be 0. So, Mn1's W/L ratio can be reduced without affecting the vout waveform. Since, the above simulation uses a vin/vout duty cycle of ~0.5, the mean power dissipation is reduced from 16.2 uW to 1.8uW. 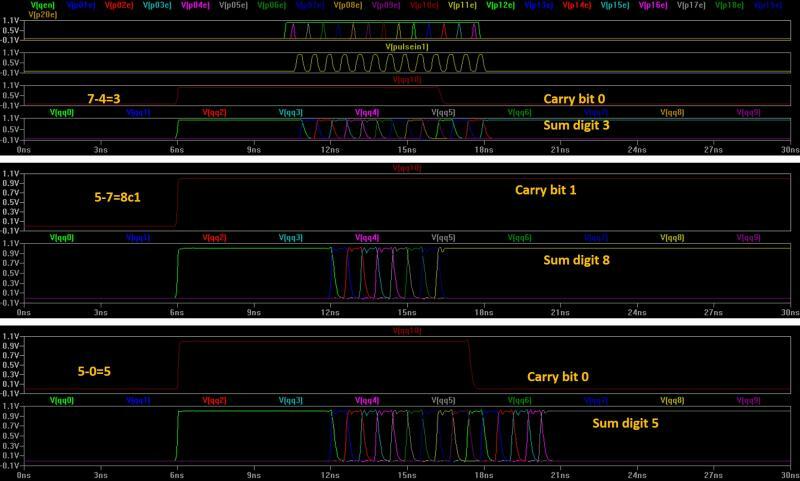 For reset pulse or low duty cycle vin/vout, it will reduce further. For a duty cycle of 0.1, it will become 0.36uW - which is quite low. Please, note that there is no change in the vout waveform, going from case1 to case2. 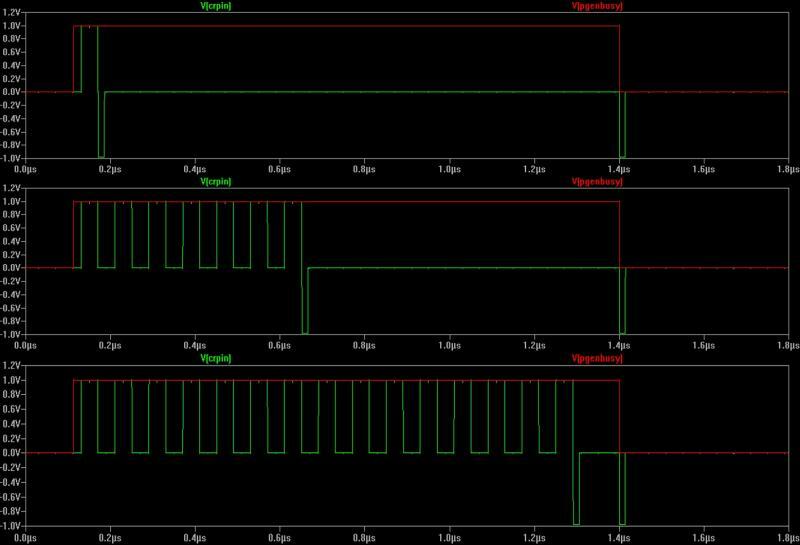 Both the top pane (PMOS) and the bottom pane (NMOS) show that the fets can be operated up to 1.8V - since the test was done for 2V. The NMOS fets used for the simulation uses L=45nm W=45nm. 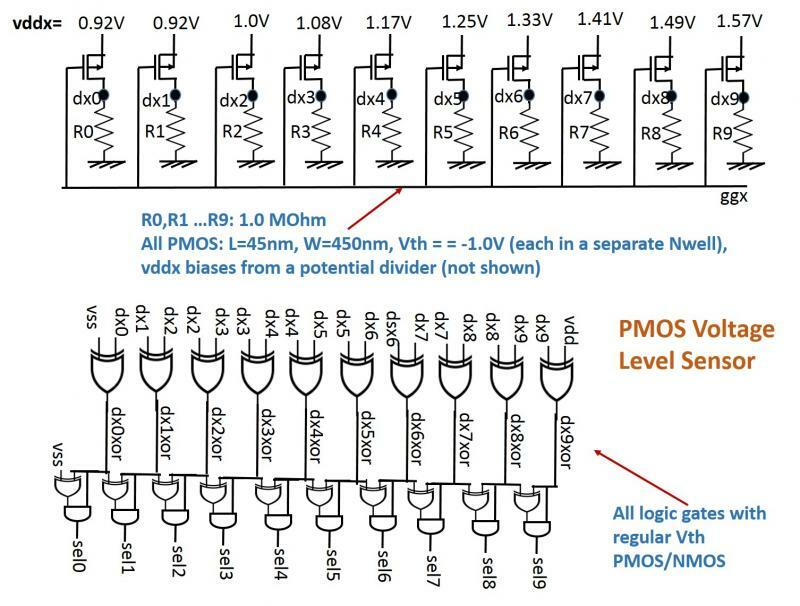 The PMOS fets used for the simulation uses L=45nm W=90nm.﻿ Please, note that there is a current path through the top PMOS and the left bottom NMOS when the vin is 1V, but for reset pulse applications, the vin is 1 only for a brief interval. 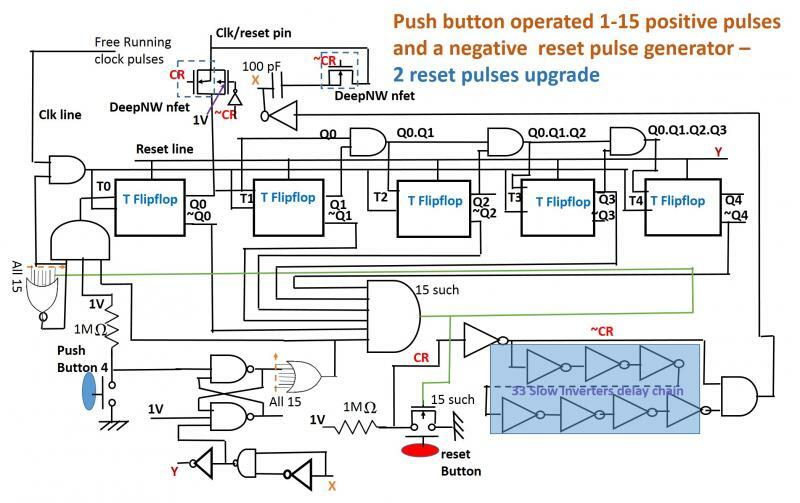 The above level shifter can be used to turn the negative reset pulses of the pgen (Item#241) into positive 1.8V pulses, as mentioned in Item#281. Three consecutive sweeps' results shown below. New data turns into the ref for the next sweep. Please, note that the top While loop is the solarcell background process (&). This Item exemplifies how the shell based logic emulation first discussed in Item#38 also applies at the system/subsystem level. Note that the waterlevel data string is getting simultaneously to a file 'waterlevel' which can be read in by a JHC emulator - the latter running in the foreground, and this then running in the background. From the simulation results, it is quite clear that between the staircasing and the pgen pulsing, the latter is slower. 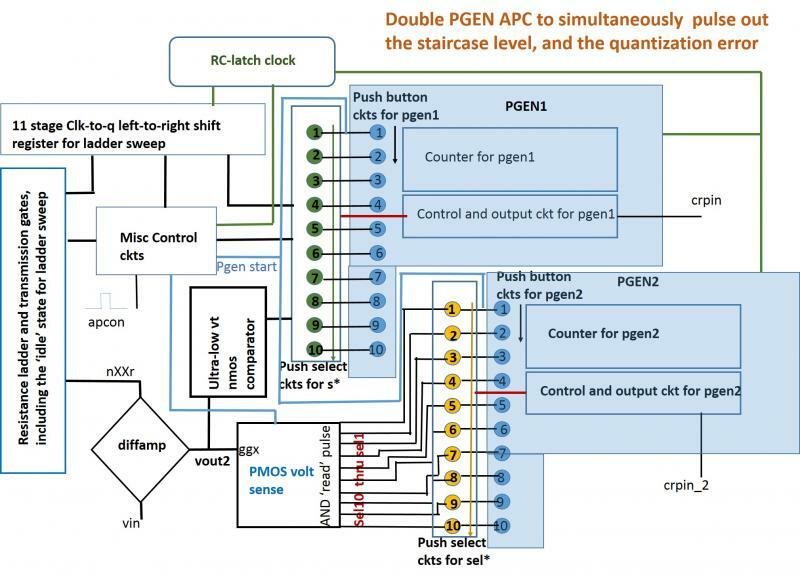 One idea can be to double the clock frequency (staircaser) and run the pgens with that. That will shink the pulsing time down. 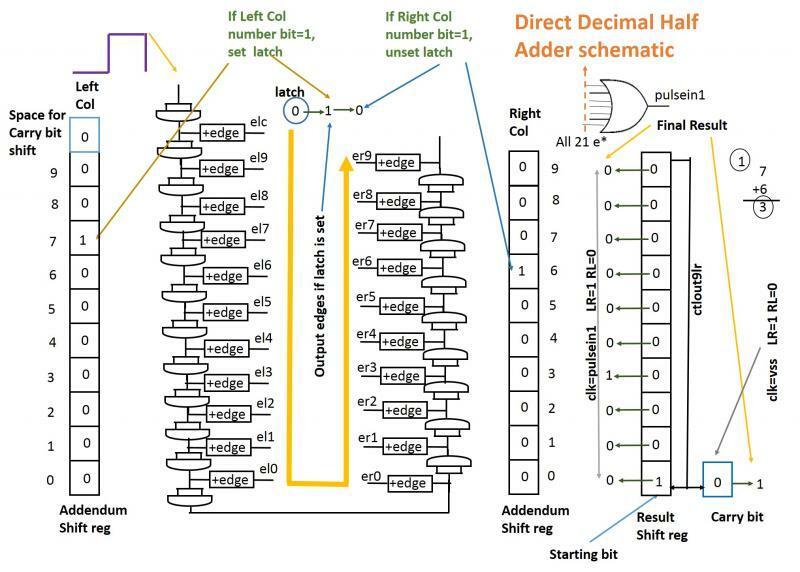 The 'data' entry into the qd0 bit of the clk-to-q shift register (see Item#242) can be disabled by a latch/AND, the latch being set/unset by the apcon/apcoff pulses. To note is the fact that this 'data' entry/non-entry starts/stops the APC. The apcoff pulse can also be autogenerated by a +edge of All LX* ORed in the pgen (Item#241). This way, one can run the APC in the unfolded mode (for example), for detecting just one voltage level, once in a while. 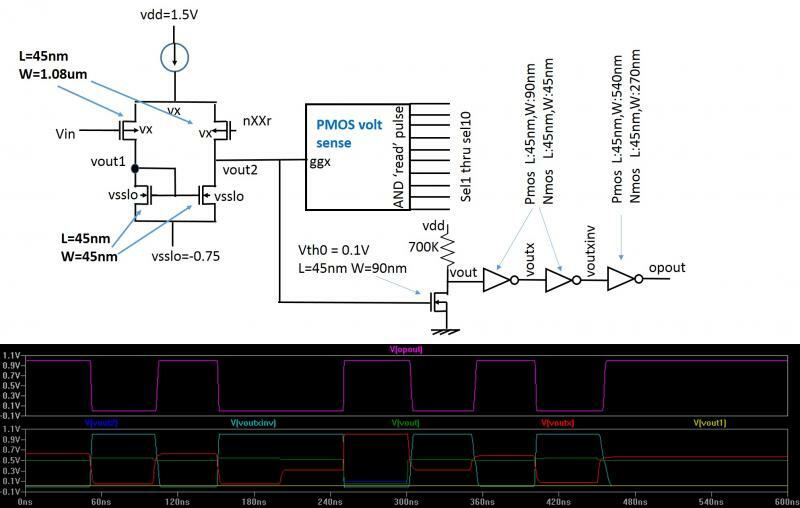 ﻿The PMOS voltage sense (Item#274) used in the APC for quantization error sensing could be used directly in some situations to sense normalized Vin, avoiding any comparator opamp/diffamp. Of course, that will be like regular AtoD conversion w/o qerror sense. 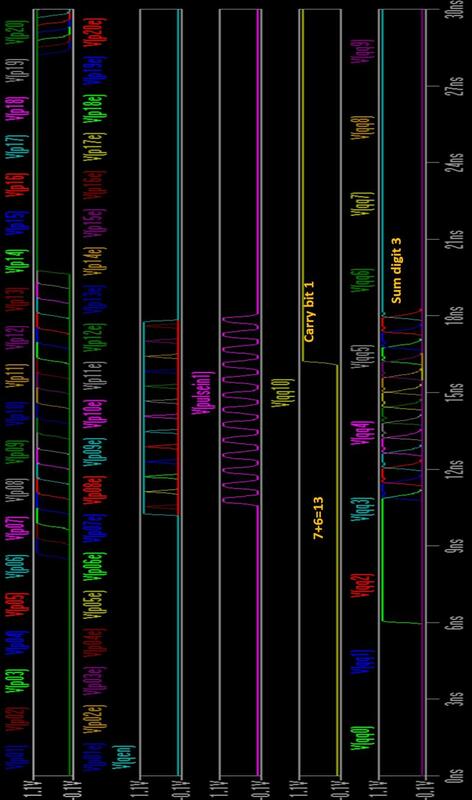 To many, what's happening inside an opamp is a mystery, here you can see what's happening - you typically like what you understand! All components used in the above diagram were discussed in earlier Items, except for the push select circuits for sel* (quantization error). 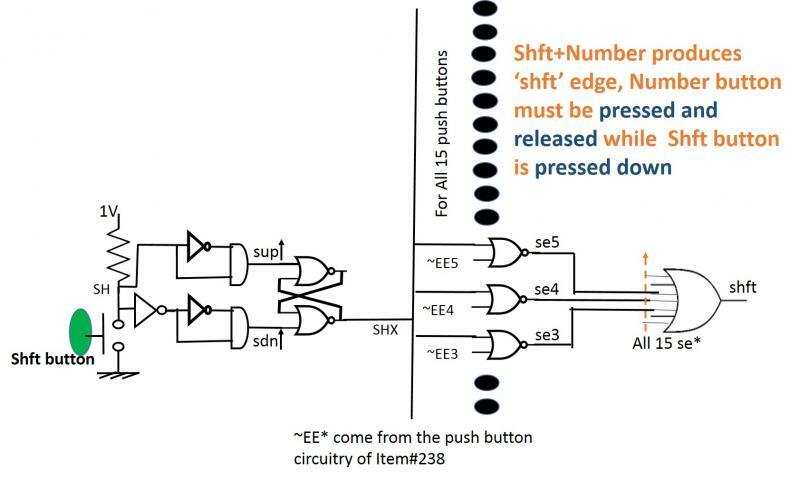 The push select circuits for s* were discussed in Item#s 244, 271. 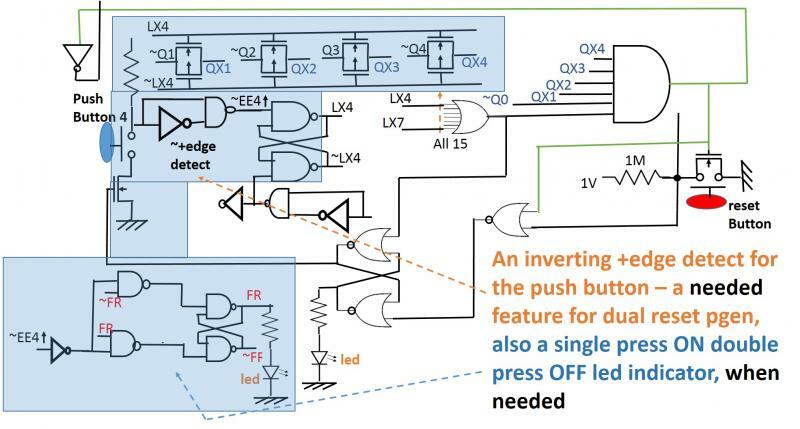 The push select circuits for the sel* are simpler. sel7 - push7 example shown below. Please see item#245, where I had indicated three serial staircasings, followed by three parallel pulsing sequences. What I have achieved instead is one staircase, and simultaneous crunching of the quantization error (Item#278). While the two parallel pulsing sequences run in folded time. Trying to achieve the 0.001 level resolution (with three digits) would have introduced inaccuracies during combining levels, capacitive charging, etc. So, this two digits approach. 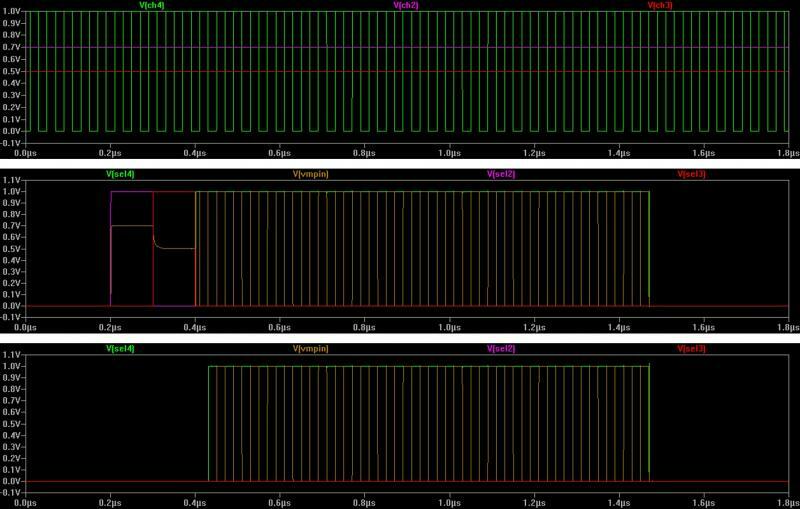 I had to adjust the Vth0 of the PMOS fets of the PMOS volt sense (Item#274) to -0.94V (from -1V), and also the PMOS source bias steppings changed to 0.075V from 0.080V, in order to get all the levels correctly. 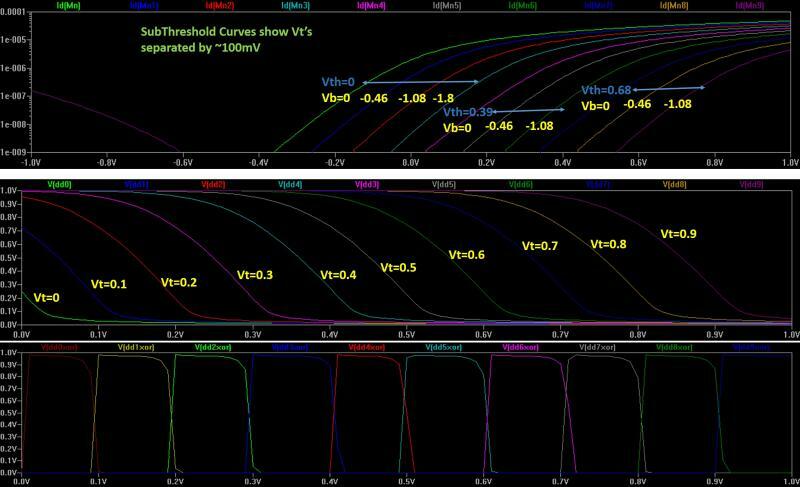 So, at this point, we are using three PMOS vth0 values in the circuit - a high vth0 of -0.94V for the PMOS volt sense, a standard vth0 of -0.587V for all logic gates, and a low vth0 of -0.3V for the transmission gates (see Item#269). 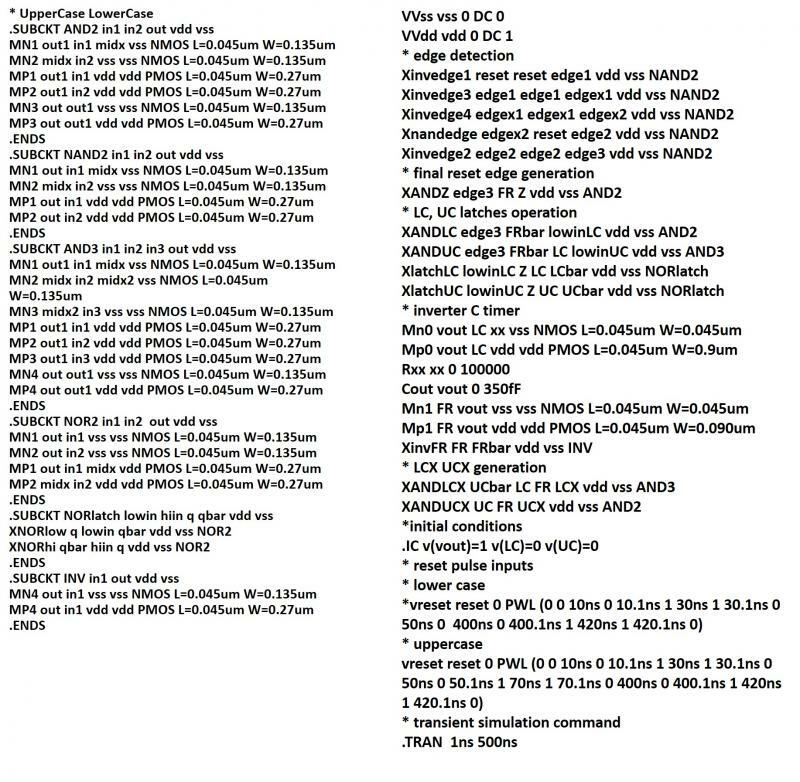 For NMOS, we are using two vth0 values - a standard vth0 of 0.623V for all logic gates, and a low vth0 of 0.3V for the transmission gates (see Item#269). 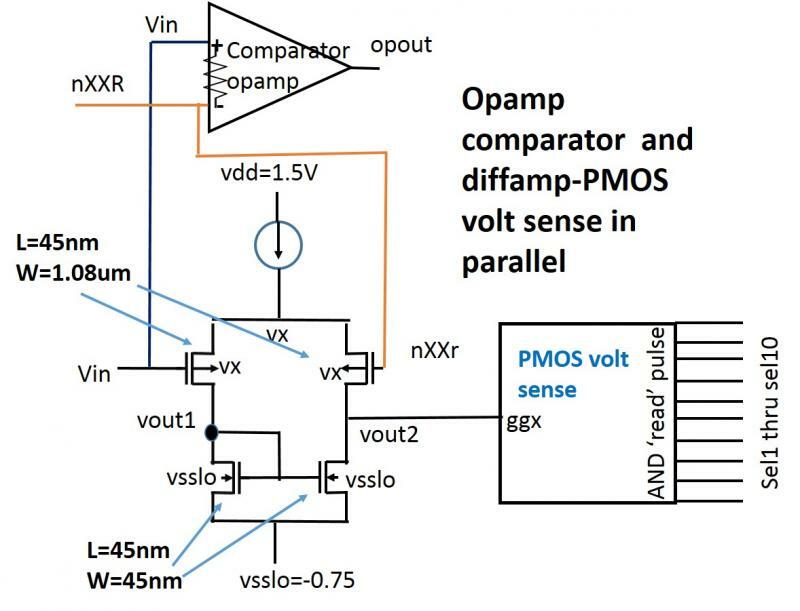 In the next Item I will discuss a scheme that can emulate the comparator function of the opamp wih the addition of a bit of circuitry to the diffamp, in parallel with the PMOS volt sense. This will totally eliminate the requirement of the opamp. 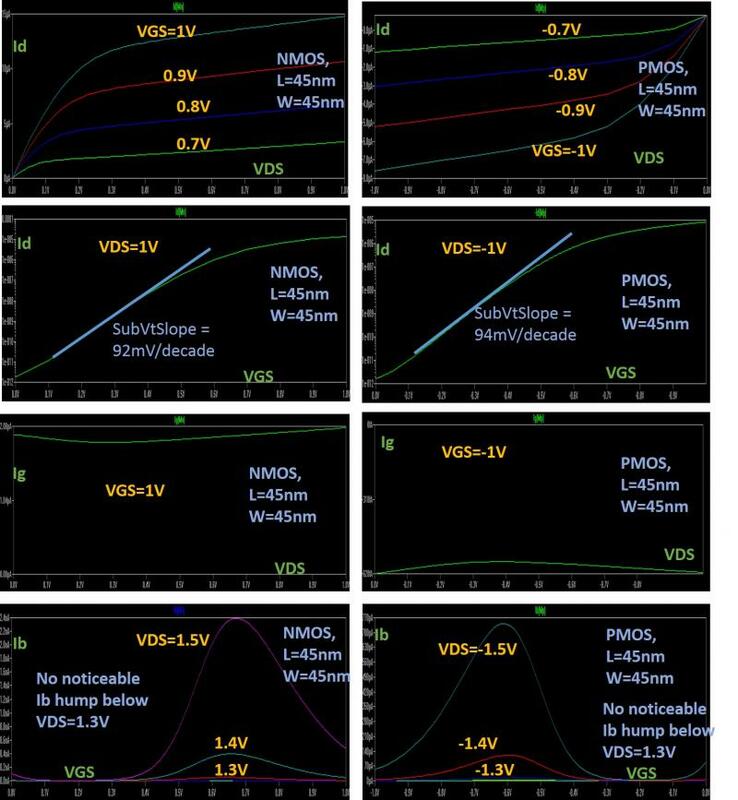 But, the scheme will need the introduction of a super low vth0 (0.1V) NMOS device to the mix. The basic idea is to place the vout2 of the diffamp to the gate of a ~0 vt (small current defined vt) NMOS with a resistive load. When the vout2 is positive, the NMOS will conduct, otherwise, not. 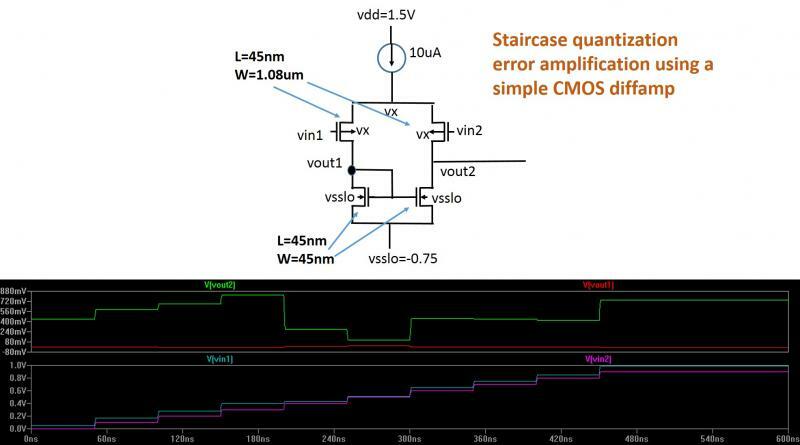 This will enable achieving 100 quantization levels using just 10 staircase steps, a single opamp, and a diffamp with PMOS voltage sense. Achieving 1000 quantization levels as earlier indicated in Item#245 is over-ambitious. Please note that the left pane represents the sensed staircase levels, and the middle pane represents the sensed Qerror levels. For examle, a level of 0.73V excites s8 (base level 7) and sel4 (base level 3). 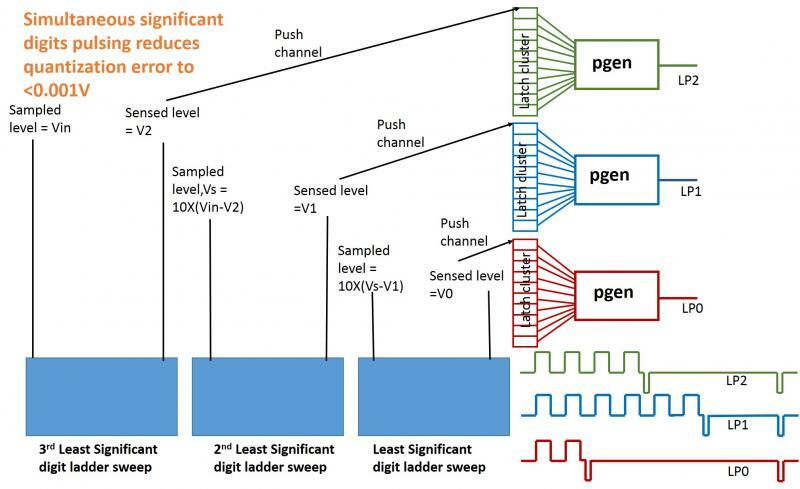 The sel* levels will be pulsed out using a parallel pgen circuit through corresponding push channel select circuits (similar to the one shown in Item#244 for the sensed staircase levels, s*). 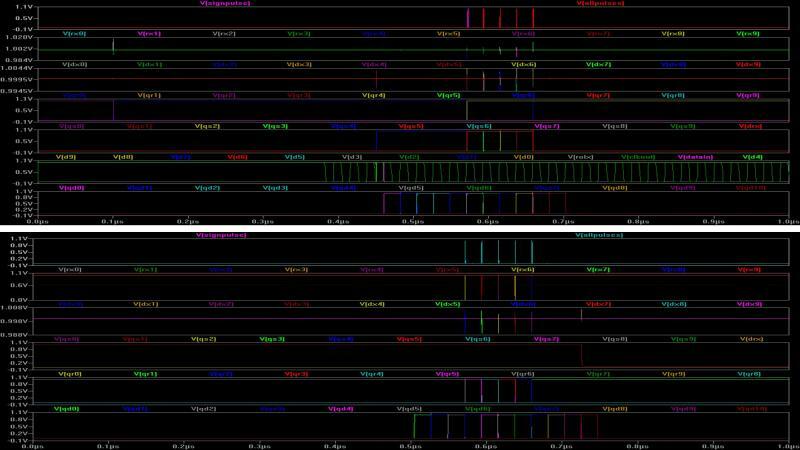 The following zoom-in shows how the diffamp's vout1 and vout2 look at the time of readout (using the 'read' edge). As is expected, the vout1 floors to ~0V, and the vout2 settles to a steady level near the middle of the *relevant* staircase step. The nature of vout1 & vout2 during all other staircase steps diverges from that under the target biasing situations simulated in Item#273, and is not relevant. The 'readpulse' generated from ~SxxAND of Item#244 unsets a latch, which is then set again by the falling edge of the clk signal in the middle of the staircase step. The rising edge of this latch's setting at that point is the 'read' pulse. Please, note that the 'read' pulses emulate the effect of a delayed inverted falling edge of ~SxxAND in Item#244. The 'read' pulse is added as an additional input to each AND gate of the XOR/AND structure in Item#274 - meant to read out the sensed level only when the diffamp outputs have flattened out. This avoids reading out spurious levels during the rising/falling shifts of the diffamp's vout2. In this case, no negative biases and deep nwells are needed. 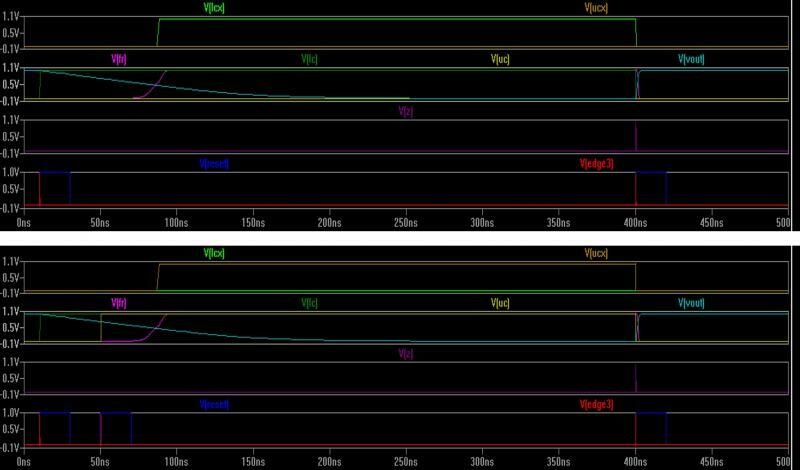 A single high Vth of -1V, and gradually increasing source and bulk (nwell) biases, possibly from a relatively lower resistance potential divider, would do the trick. If we had gotten a gain of 10 from the diffamp of Item#273, these bias potentials would go up by 100mv at each step, but, I have kept the differences at ~80mV to account for the ~8.2 gain of the diffamp. The AND and XOR combination at the bottom is provided to account for the overlaps in the sensed level pulses dx*xor. For example, if the v(ggx) is such that both dx4xor and dx5xor can excite the next stage as a "1" level, only the dx4xor will be chosen. This is the same logic as in Item#228. 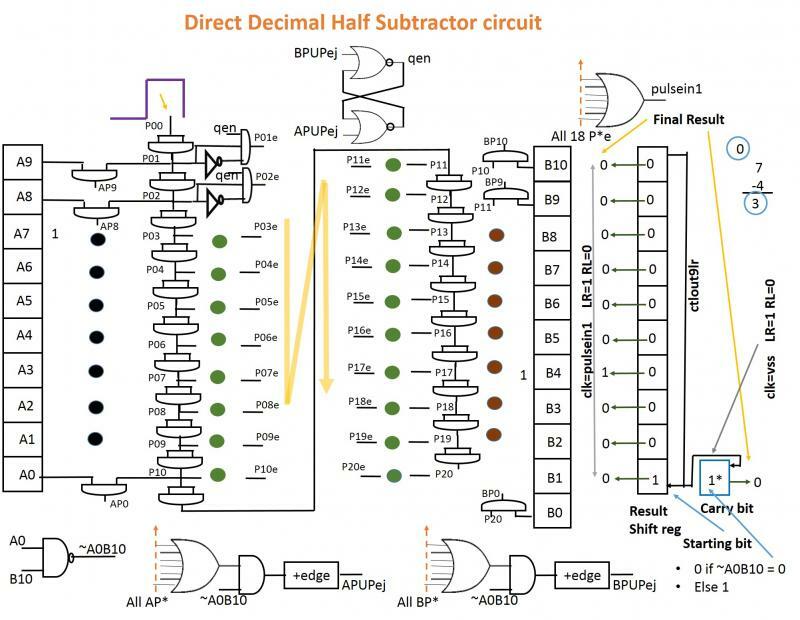 Although this circuit is meant to sense the amplified quantization errors of the APC of Item#271, one can think of using it for large signal digital based amplifier or feedback. No opamp is being used. Please, note that this is a test of the moving staircase levels difference amplification - V(nXXr) of Item#271 corresponds to Vin2 here, and the V(vin) of Item#271 to Vin1 here. The biasing and the fet sizes have been adjusted to generate a ~0V floor for vout1, so that the vout2 represents the amplified quantization error. The amplification is reasonably linear with respect to the voltage differences, but the gain achieved is <10. So, the Vt's of the multi-vt structure need to be slightly lowered to account for the <10 gain here. 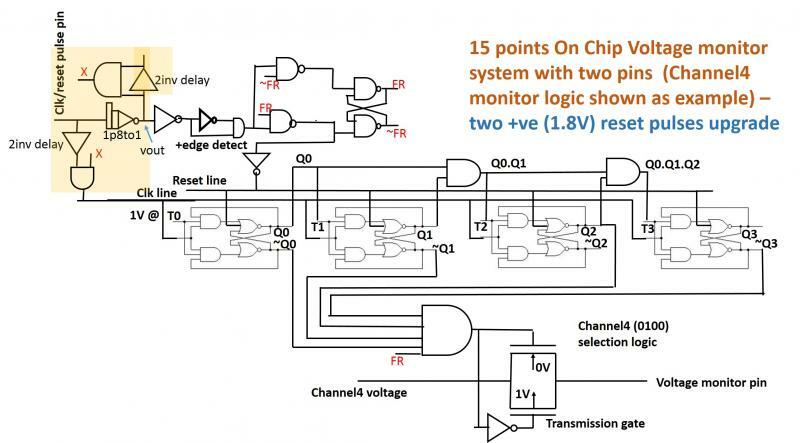 The negative Vb biases needed for the deepNW enclosures can be obtained from a resistors based potential divider out of a -2V or -1.8V bias produced on chip with an opamp (by inverting a positive voltage), or brought in from off chip. A similar scheme can also be drawn with PMOS devices on separate nwells - that way, we can avoid using deep Nwells and negative biases. This helps in increasing the analog data sampling frequency - brings the sampling time down from 775ns to 504ns, for a 44MHz clock. When the sample sensing (staircasing) is going on for a particular data sample, the previous sensed level (pushx) is getting pulsed out. Achieving roughly 2Mcycles/sec sampling rate in this case. The very first pulsing cycle is a dummy cycle producing just 1 pulse. The main difference in the circuit involves retaining the sx levels till the end of the ongoing pulsing cycle, and letting the pushx get generated by the pgen reset pulse, instead of with qd10. Also, the data entry into the clk-to-q staircaser happens right after the pgen latch for pushx is set. Let's say, you are in a 45mph zone, transitioning into a 35mph zone. The new Ref level is set for 35 by virtue of wireless signaling from the speed limit signs, and the car's actual speed is captured in the Data column - so you need to do relative data shift to get the speed back to 35, if fluctuations occur in speed, AND there are no obstacles in view. 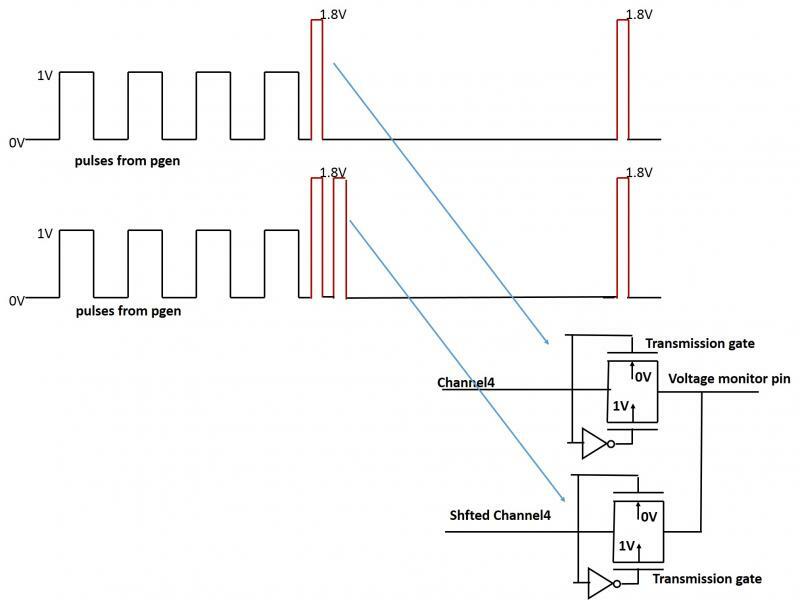 Of course, in many cases, the pulses from the relative shift may not go to a stepper motor, but to some other voltage controlled device through a pulses to analog converter such as in Item#166. Why is the above algorithm slightly different from that of Item#247? Answer: you can post speed limits (or similar) to a driverless vehicle, but you cannot post level limits to water in the bay/lake. You can start a pulse train at any stage, stop anywhere, oscillate, fork, generate finite number of pulses from it, divide clock frequencies in a specifiable way, run it in the counter mode for deep frequency divisions and binary interfacing, do decimal calculations with it and store decimal numbers, use it for sweeps, and so on ... an ultimate protocol cruncher! Also, you can easily convert it into a one-directional shift register (Item#172). 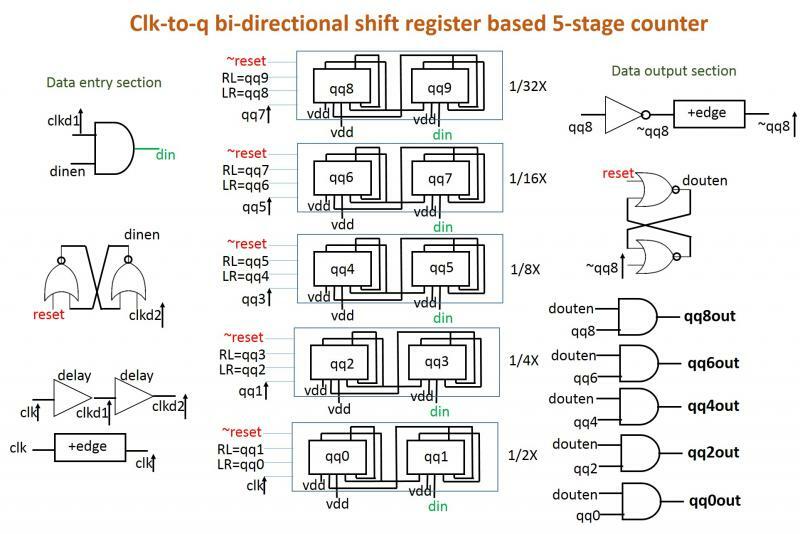 Bi-directional shift registers are not new, but, 50% gate count reduction is a striking feature of the clk-to-q shift. 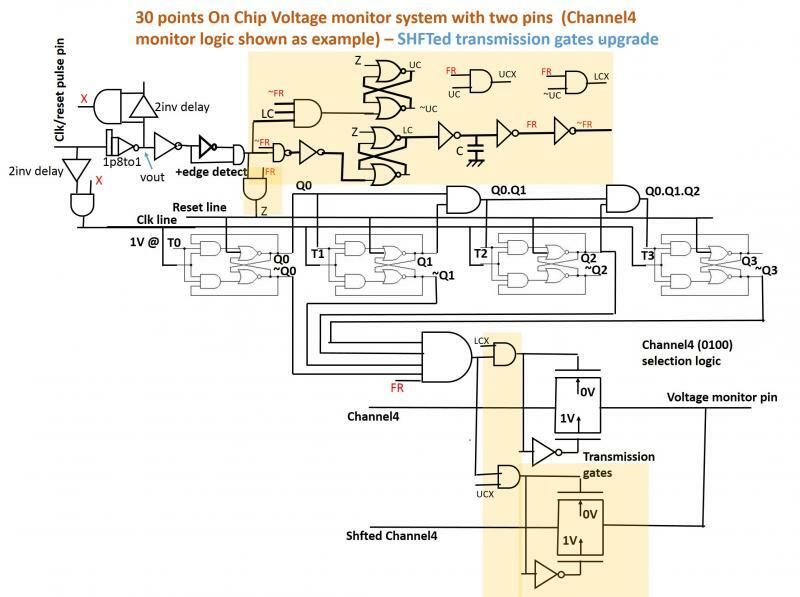 Because, it is getting so much smaller, and easy to hook up (as seen in earlier examples), more and more chip designs can use massive forks to accomplish tasks along the way. Various things happening at various locations of the maze, maybe, even at different frequencies. It's like townships (logic structures) building up along the banks of a flowing river, and getting things done. Three cases shown, top: qx6=1, qy5=1, middle: qy6=1, qx5=1, and bottom: qx5=1, qy5=1. Note the clipping of the advancing wavefront in the top and middle panels (top panes), as soon as the neq is set. But, in the bottom panel, since qx=qy, the neq is not set, and the wavefront goes through unclipped. 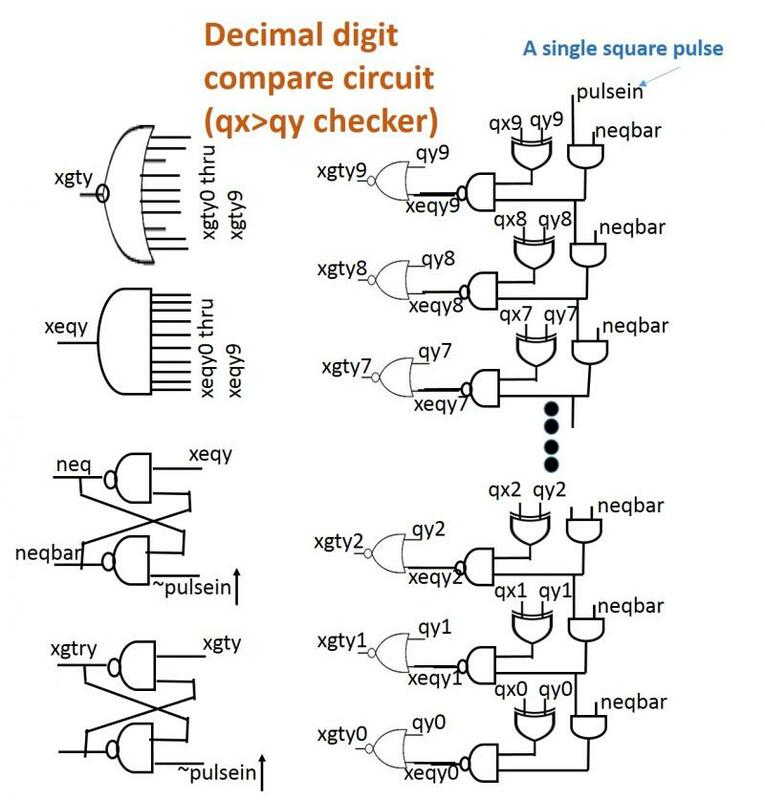 The sequential pulse based checking requires much less circuitry than elaborate non-pulse based X>Y checkers, and fast enough to be completed within a clock cycle. Also, if neq=0 at the end of the columns, this can be used recursively to compare another pair of columns. Not just decimal digits where only one bit per column is 1, this can be used to compare any two ten bit binary numbers. The board is initialized to 000 by applying the inverse of the delayed falling edge of the reset pulse through p00, p01, p02. 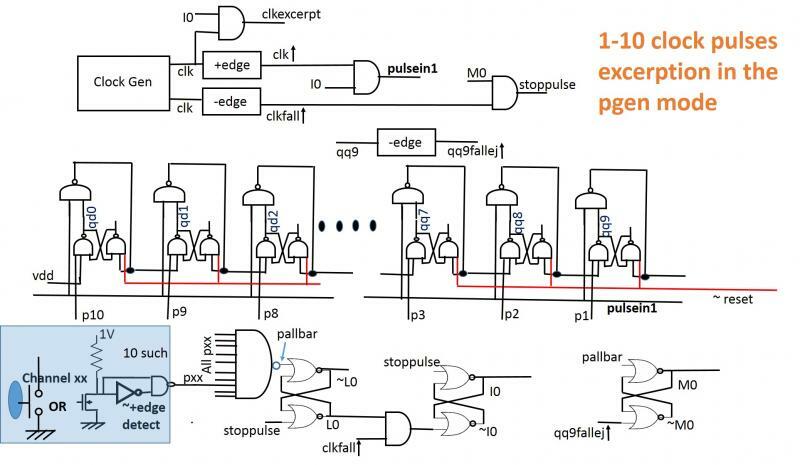 Once initialized the board will keep adding and subtracting in response to incoming pulses (clk) which can come from a latch cluster based pgen such as in Item#170. Following simulation results show the cases where 235 pulses are added (LR=1, RL=0), and then 235 pulses are subtracted (RL=1, LR=0). To note is the fact that the above three digit decimal board is clamped at 999 and 000 for the highest and the lowest numbers. In the top panel, the initial state was 000, and in the bottom panel, it was 235. Of course, you can start at any numerical state between 000 and 999. 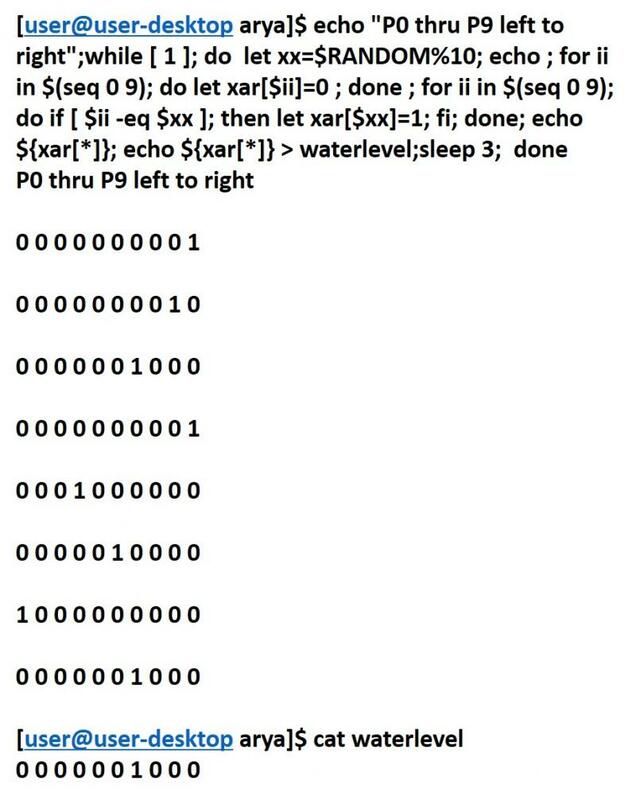 To make the highest number 999999, you need to add three more shift registers, etc. Note how groups of two register stages are being used to half the input frequency, and drive the next duo. 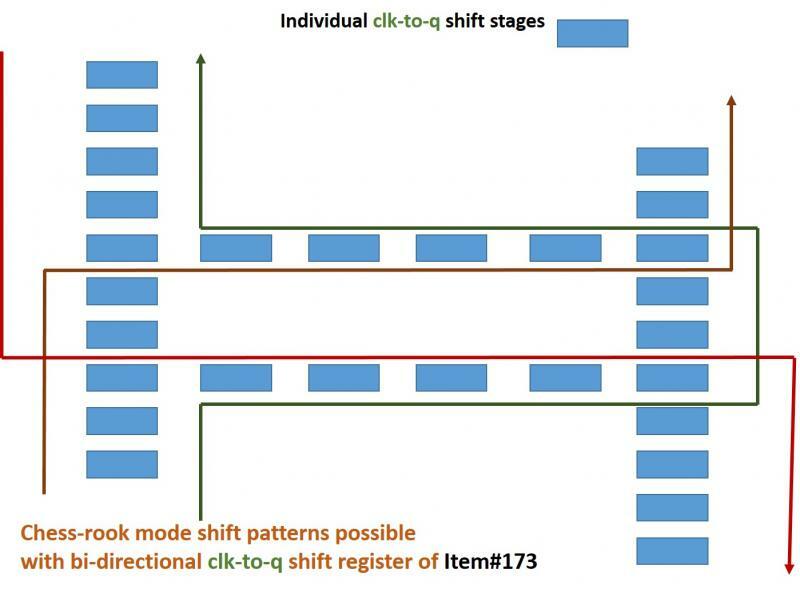 Obviuosly, this counter arrangement is not as fet-count friendly as the clk-to-q T-flipflop based Counter in Item#184, but, this has value from the one shift register type can do it all premise. Also, this counter involves some interesting logical synthesis. Please, note that in some generalized fork situations, LR, RL states will need to be swapped/localized just before the forks happen. The transistor sizes are model and tech node dependent, since relative delays are involved. The small size of the individual stages helps the Moore's law. 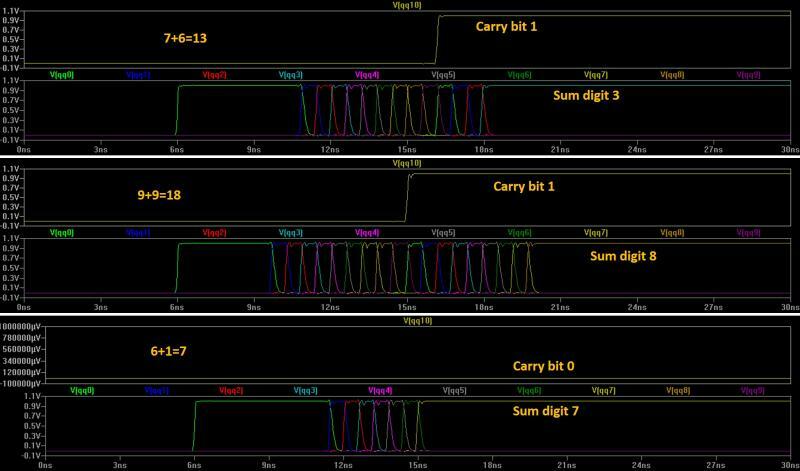 They can be easily hooked up, as the previous examples involving the one-directional shift stages show - amenable for serial and parallel data entry and data read. One thin clock edge can drive many stages. A bi-directional shift register can be adapted to multiple 2N frequency divider applications, keeping I0 (see Item#254) up while shifting left, and down while shifting right. Also, the small stage size creates the possibility of register mazes allowing various chess-rook shift patterns, as shown below. Borrowing the concept of shunting in railway tracks - logically opening and closing sub-routes. Item#255> What about the reset pulse for the excerpted pulses in Item#254, to mark the end of excerption? It's basically the envelope pulse I0 sent out in a side channel. 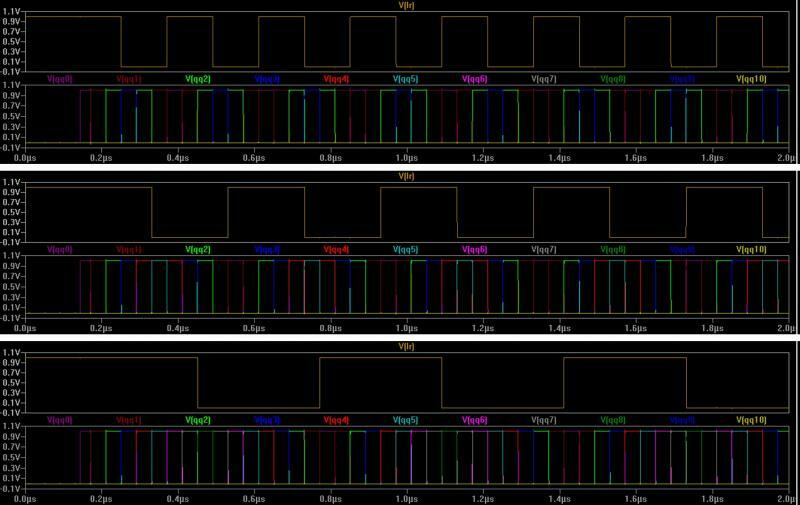 Interestingly, I0 can also be used to observe/replicate the dataflow at any point in the circuit for the requested number (n) of clock cycles, by ANDing I0 with the potential of that point. It's like excerpting the flow of a river, as shown below. where T is the period of the clock pulses. In Item#253 pulse thickening was done using excerption from the home made oscillator (RC-XOR based), the input being the thin edges from a circuit like the JHC (see Item#s 248-249). But what if you want to excerpt the requested number (1-10) of pulses like in a pgen (Item#155) from the system clock? Here is a way to do it. More than 10 pulses can be requested by using decimal clusters such as in Item#170. Note that the Clock Gen is just the system clock available in all digital systems (microchips). Again, like in Item#253, we have three latches, L0, I0, M0 with similar functions. The excerpted pulses (clkexcerpt) are put out by ANDing the clk with I0. In the below panels, I have shown 3 cases where 10, 1 , and 5 pulses were requested, as examples. 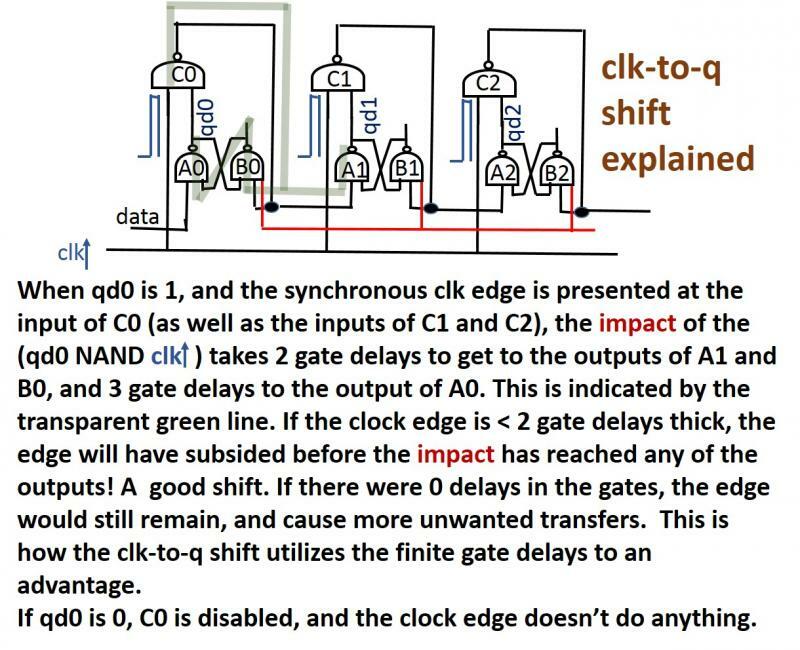 Please, note that I have added a new stage, qq10 to the clk-to-q shift register. This stage is set by the +edge of the oscstart pulse, and is meant to remain always set for the entire course of the free pulses run, because this stage now drives the oscillator charging/discharging cycles. I have also added three more latches, L0, I0, and M0 to control the process of excerption. The four excerpted pulses are shown in the top pane, the next pane shows the free running pulses. The sequence of events should also be clear from the above panel. First, the oscstartej happens, to start the oscillator. 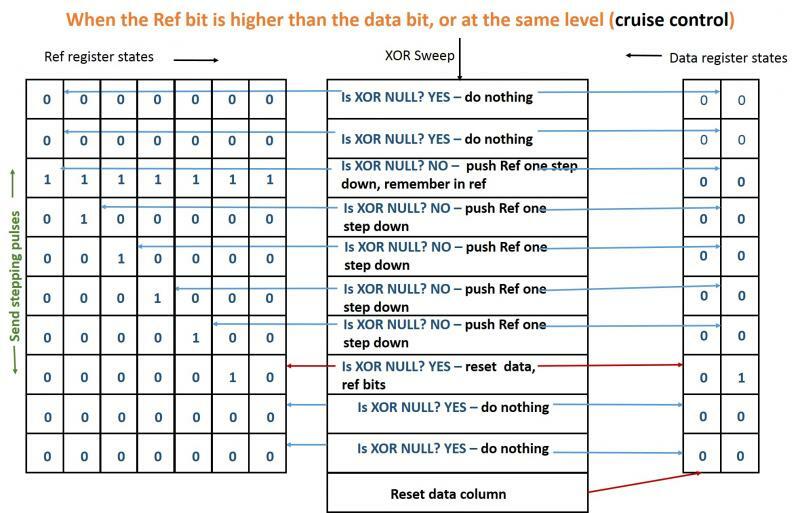 Next the readoutej starts the XOR sweep (see Item#249) - giving rise to, let's say, four edges that are getting mounted to the qqxx register (third pane above). 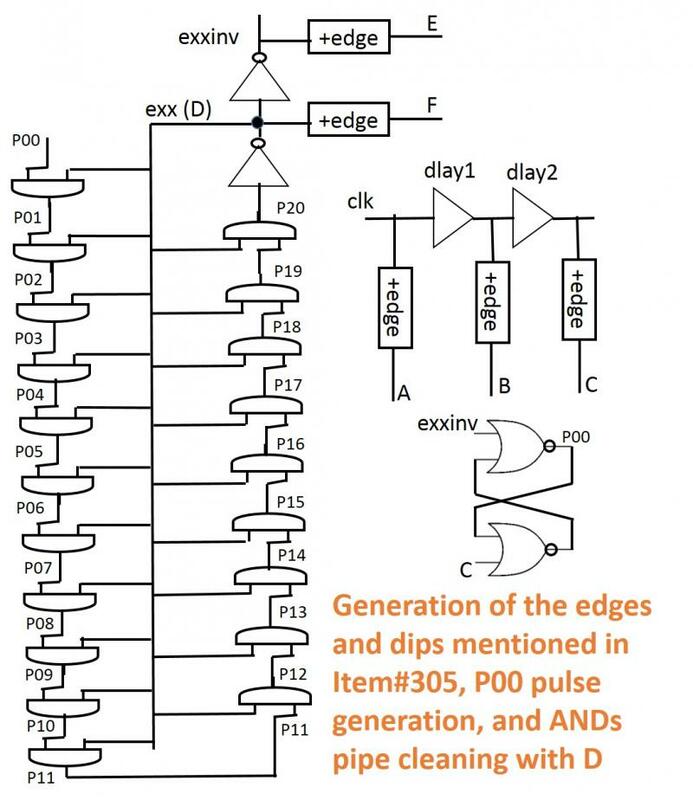 The qd10 +edge (ending the XOR sweep) sets the L0 latch to let the next pulseins enter the register as pulsein1. The first pulsein1 sets the latch I0 to mark the start of pulse excerption. Exactly four pulsein1s enter, the last one coinciding with the falling edge of qq9 - sets the M0 latch, indicating that we are to excerpt only one more pulse. And. that pulse's falling edge resets the L0 and I0 latches - stopping pulsein1s and excerption, leaving qq10 at 1, to continue the oscillations. Please, also note the dismounts of the qqxx states in the third pane - this indicates proper data shifts through the clk-to-q shift register. It's simply two inverters in series - the first inverter uses an ultra high Vth (-0.95V) PMOS, and the second uses an ultra high Vth (0.95V) NMOS. 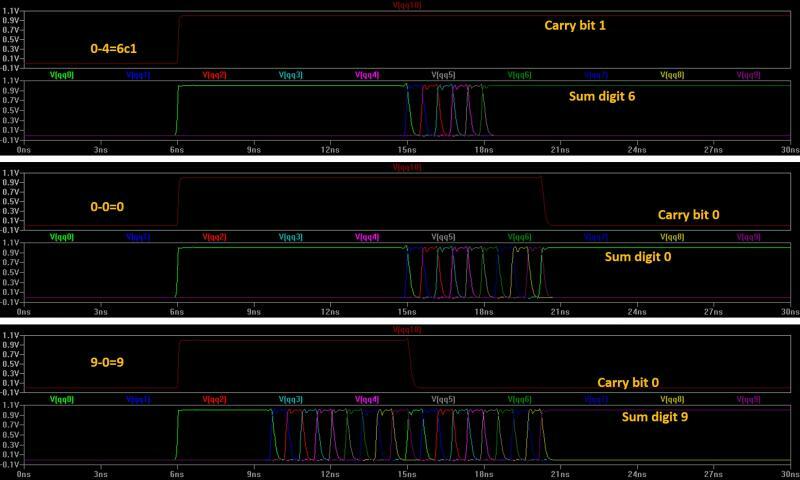 Note that the first inverter's rise time is kept slow using longer channel length, narrow width for the PMOS, and higher load cap coming from the second inverter's regular PMOS. This way, it is possible to detect a very low voltage on Ka, around 19mV. The third inverter is just a regular one isolating the 0 sense inverters from the +edge sense circuit. An important thing to note is that the 0 sense circuit typically will not sense the absolute 0. 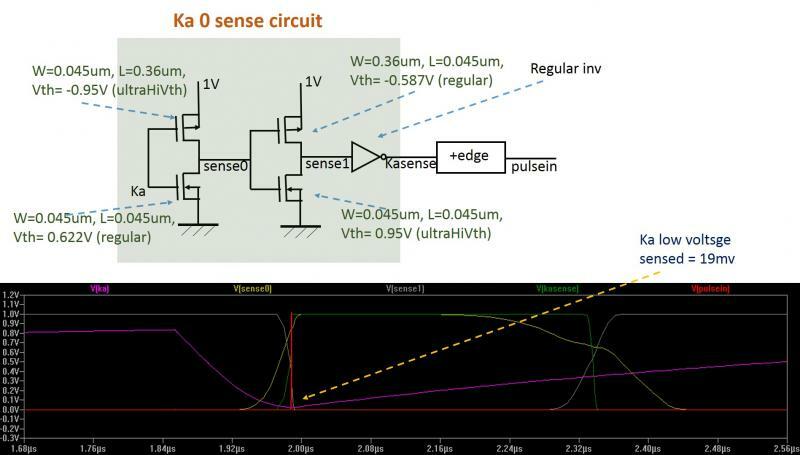 So, since the charging cycle for the first pulse starts from 0, the succeeding ones start from the low 0 sensed value. So, the first pulse is slightly thicker. The following simulation result where the pulse thickener circuit was run in a free running oscillator mode (not letting the pulsein get into the clk-to-q register), while the succeeding pulses measured 1us thick, the first pulse was 2ns thicker. Now, is it possible to excerpt a few pulses, a finite series, from the free running pulses, leaving out the first pulse? We will explore that later. Probably a pulse generator without using counters can also emerge! The shaded regions are where changes and additions happen with respect to Item#250. 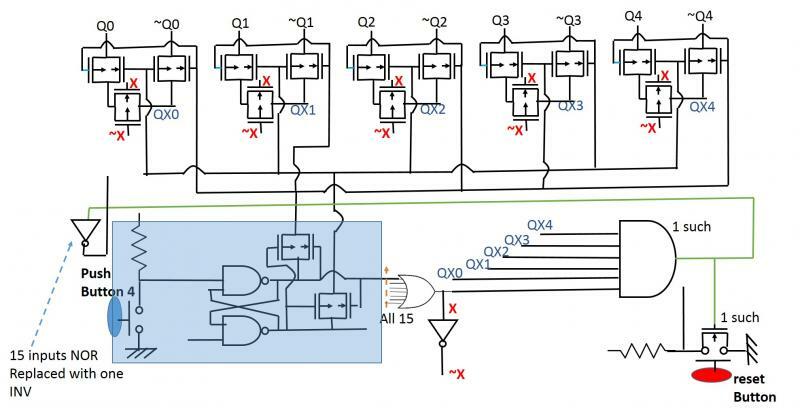 This is accomplished with the following circuit that includes a clk-to-q shift register that queues up the incoming thin edges in the descending bits (qq9, qq8, qq7 ... etc.). At the end of the train of pulse edges, one by one, the bits are pushed out to the qq9, and thickened with the help of an RC-XOR circuit. The qd10 +edge and the readout +edge come from Item#249. The circuit was simulated with R1=1KOhms, R2=10KOhms, C1=100pf, C2=100pf - to get pulse widths of roughly 1us, while the 4 incoming thin edges are only 0.5ns wide. The top panel is a zoomin of the early part of the second, that shows the 4 incoming edges, and how they are getting sequentially mounted to the clk-to-q shift register. The second panel shows the charging-discharging cycles, the clk-to-q shifts, and, of course, the KXout thick output pulses. Various combinations of R1,C1,R2,C2 can give different pulse widths. 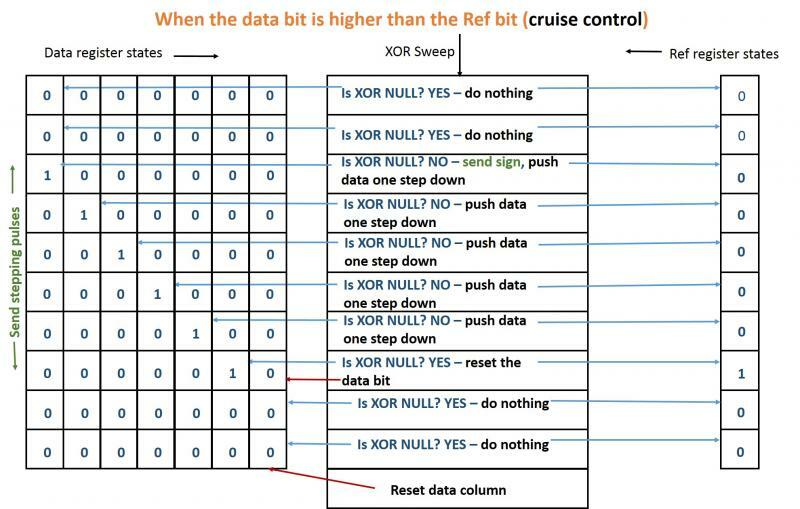 While the simulation demanded a number of implemenational changes with respect to the circuit of Item#246, the main difference is that I am now using simple interconnected latches instead of the clk-to-q shift registers for the data and Ref columns (see Item#247). The actual circuit simulated will be described later. 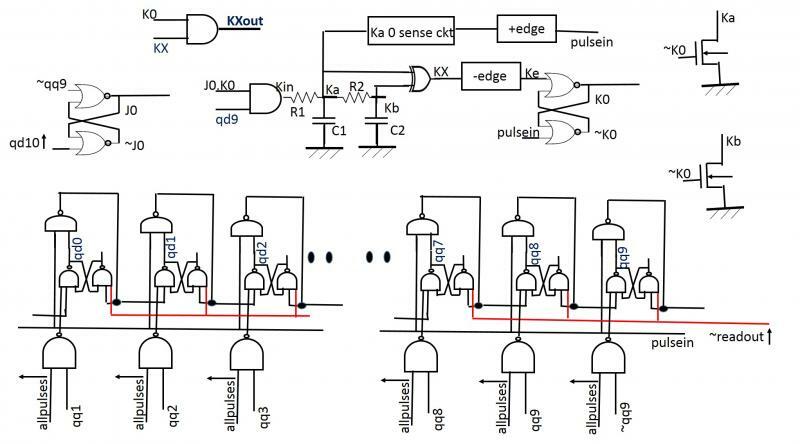 The clk-to-q shift register (qd0-qd10) is only used to generate the XOR sweep pulse edges, and the reset pulse. 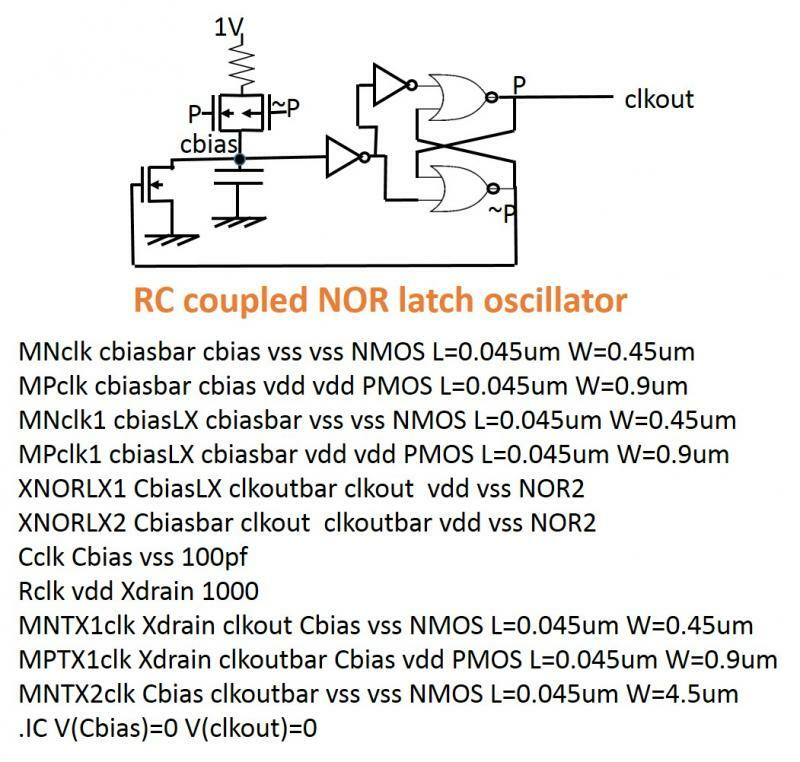 The use of simple latches for the data and the Ref columns saves the clk-to-q shifter NAND gates - reducing transistor counts. 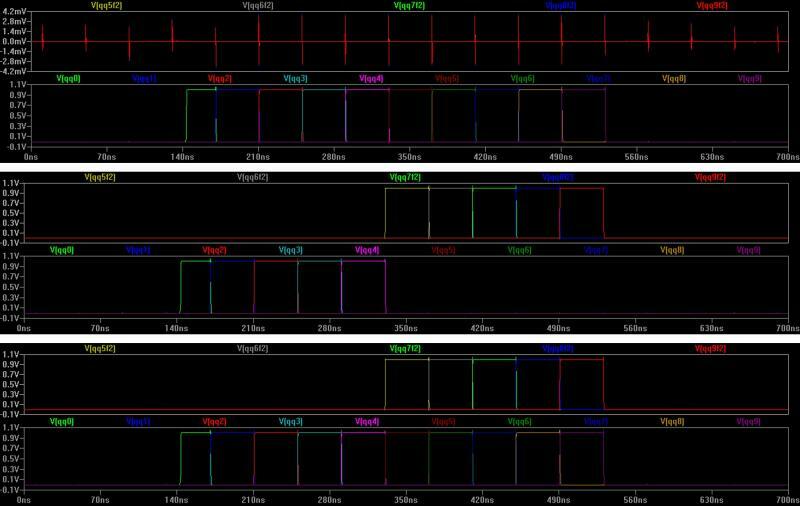 The top panel shows the case where the data bit qs4 is higher than the Ref bit qr0 - note that 4 (4 - 0) pulses (red) come out in the top pane, preceded by a pink sign pulse (goes into a signpulse channel). The bottom panel shows the case where the Ref bit qr6 is higher than the data bit qs1. Again, in the top pane, 5 (6 - 1) pulses (in light blue) come out, but no sign pulse this time. 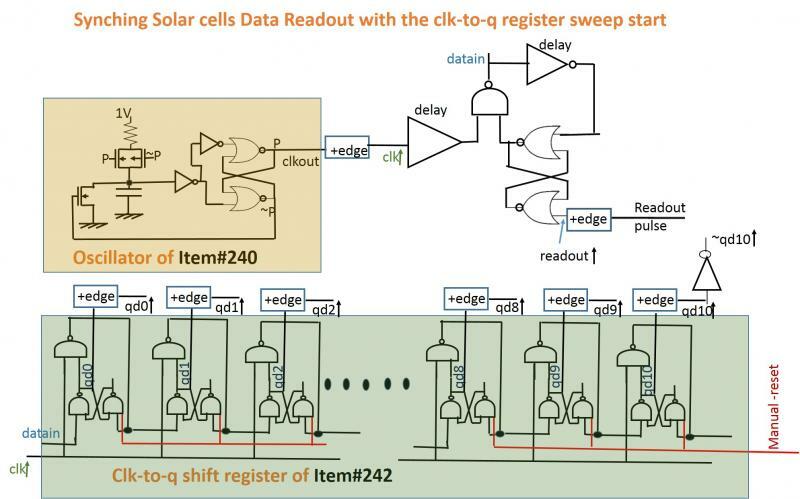 Since the sensor (solar cell) outputs are already quantized, this two shift registers (one for new sensor data, the other for memorizing the last height) approach is applicable. 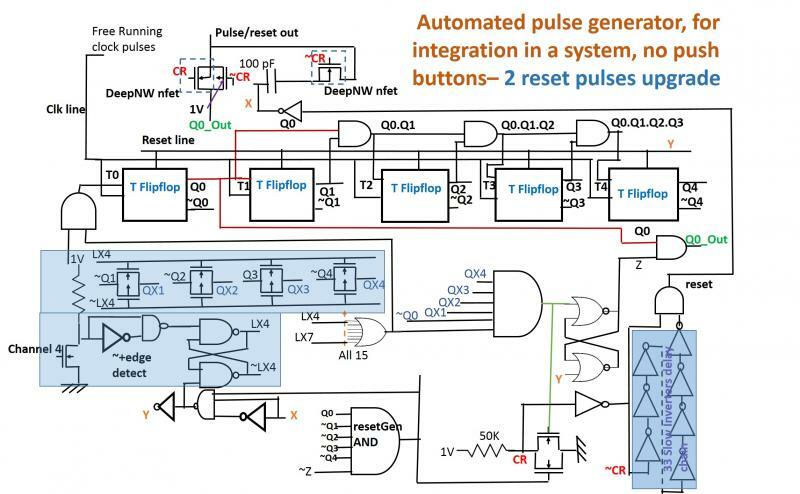 There is a third shift register (not shown in this diagram) that is supplying the sequential clock and the reset pulse. The scheme (item#242) for APC ladder sweep can be used for that purpose. 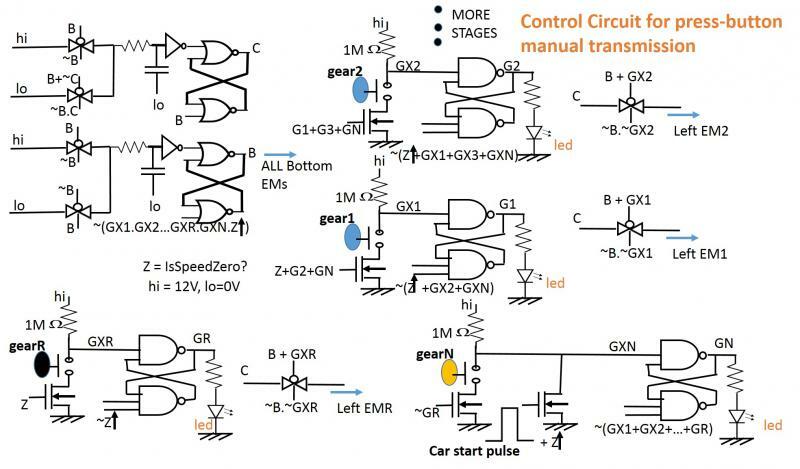 The JHC circuit is yet to be simulated. Since the entire voltage range of 1V is divided into 10 equal intervals, the maximum difference between a sampled level (Vin) and the sensed level of the staircase can be 0.1V. 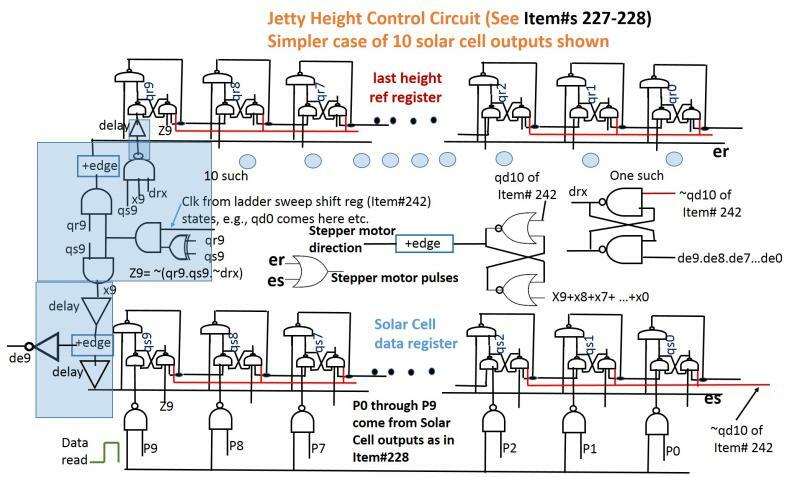 But, this error can be reduced by the scheme shown in Item#189 (the circuit needs some changes) by recursively using the same ladder and sensing scheme for the three significant digits, and retaining the push channel levels in the three latch clusters. When the three recursive ladder sweep cycles are over, simultaneously start three parallel pgens to pulse out the three significant digits. On the PAC side, three vmons would receive the three significant digits and combine them. This way, the quantization error can be reduced to 0.001V. qd* pulses come from Item#242, and are shown in the top plot. As soon as the ladder sweep (Item#243) is done, the integrated pgen (Item#241) pulses out the selected channel (shown in green, top plot). 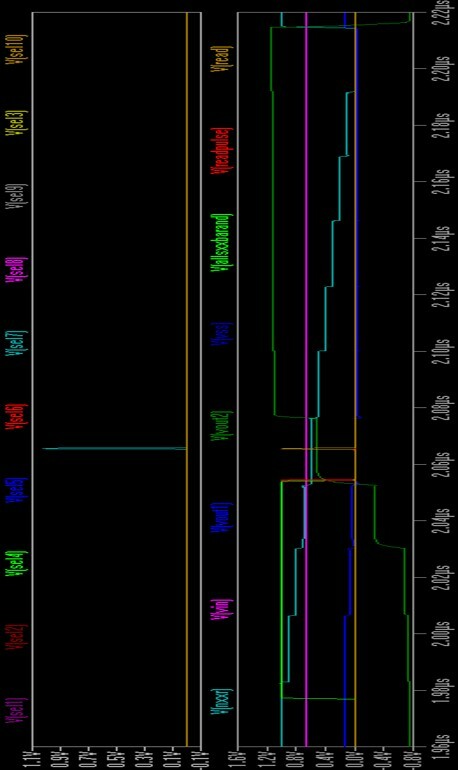 The bottom plot shows the ladder sweep output staircase superimposed on the sensed voltage level (Vin). Also the respective channel select latch states along with the push* pulses are shown. The APC is run using the clock shown in Item#240. 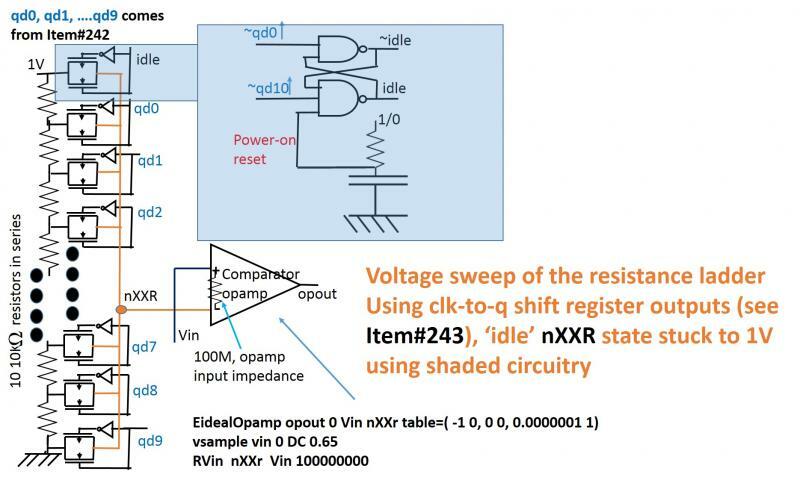 Please, note the sweep voltage staircase at the nXXr node. 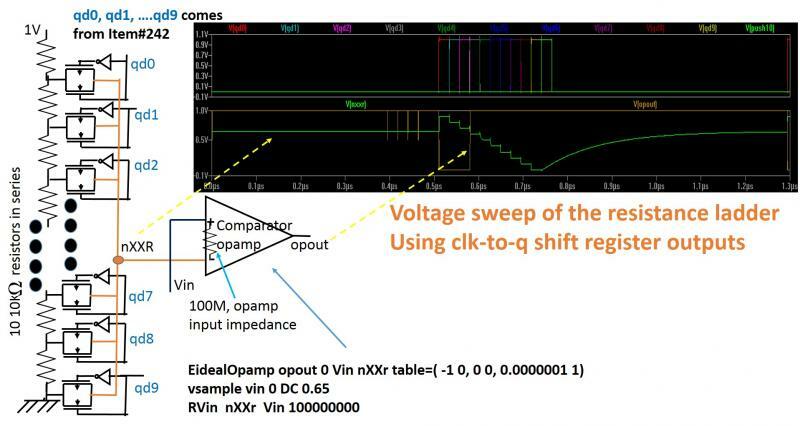 Since a steady sample voltage of 0.65V was applied to the Vin non-inverting input of the opamp, the opamp output (opout) sharply rises to 1 when the staircase level descends below 0.65V. Next we will convert the level sense to an appropriate push channel of the pgen. Making some changes here with respect to the conceptual schematic of Item#163. From 15 quantization levels to 10 - requiring the pgen (Item#241) to put out a maximum of 10, and a minimum of 1 pulses. 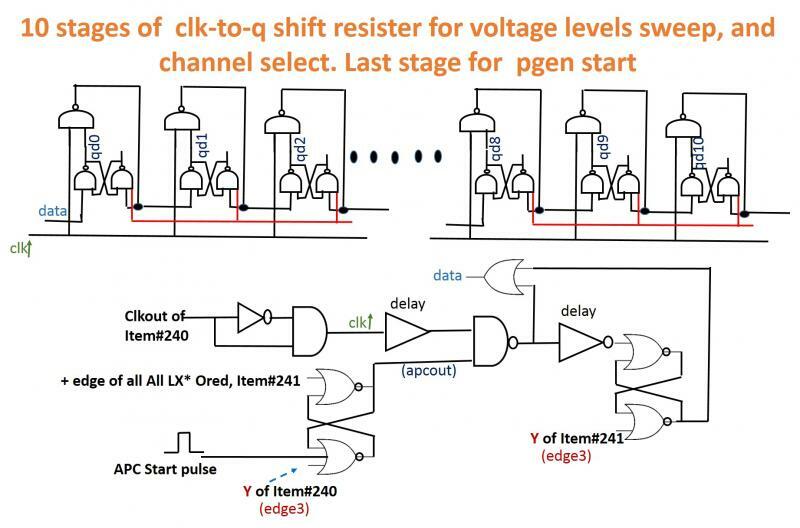 The top inverter delay chains for voltage levels sweep are now replaced with a clock synced clk-to-q Left to right shift register (10+1 stages), first discussed in Item#172. The last stage output (qd10) is used for level read at the end of the sweep, and activating the appropriate channel of the pgen. The simulation shows three cycles of voltage levels sweep immediately followed by pulse generation. Please, note that the shift register works with the clock's + edge - one good thing about working with thin clock pulses is that you don't need to fix hold time issues. 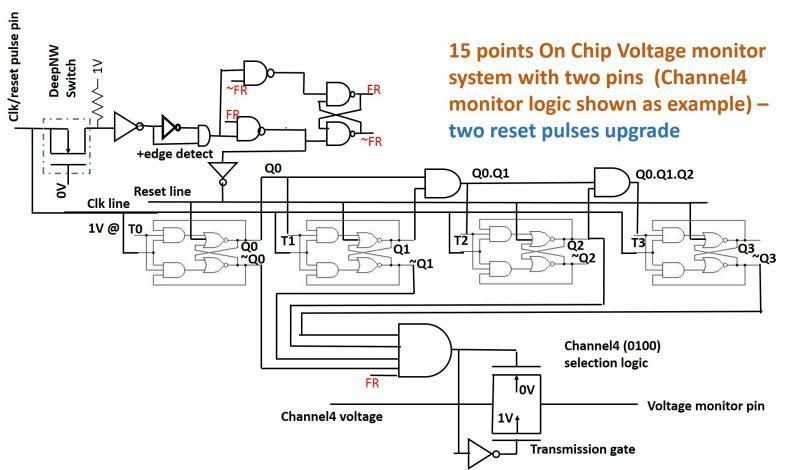 As with the manual reset pgen, 1-15 pulses are generated depending on which channel is pulsed from a previous stage. Channel4 input stage is shown as an example. Unlike the manual reset button pgen (Item#230), the toggle is not turned off until the final auto-generated reset pulse. Please, note that the final reset pulse is getting generated at state 32 (31+1) of the counter. 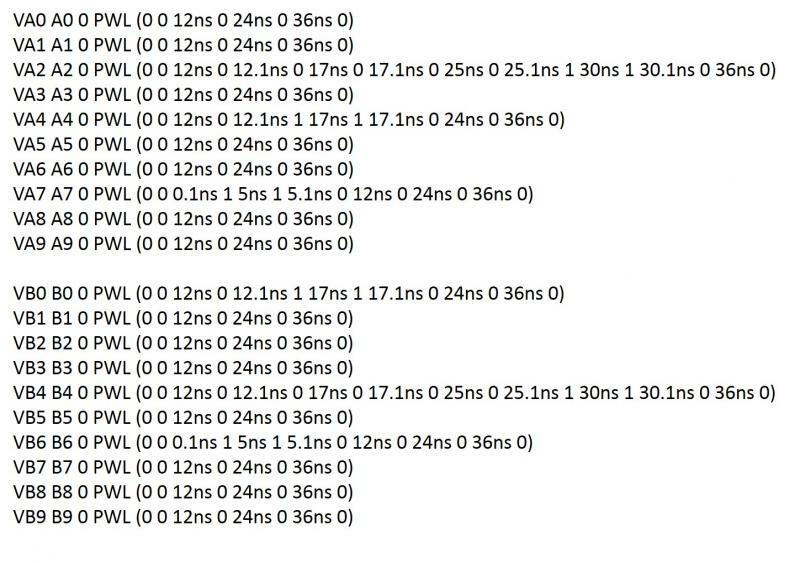 An example simulation generating 15 pulses shown below. The simulation uses the oscillator of Item#240 for clock pulses. The cycle extends from the begining of the first pulse, till the end of the last reset pulse - relevant for the purpose of estimating sampling rates etc. Please note from the top figure that the average power consumption of the pgen with the clk generator embedded is about 50uW. There were minor implementational adjustments (sizing of gates, resistance values, etc) while doing the simulation. Relevant parts of the design shown. Since the first reset pulse is auto generated, it comes quickly, hence the push button's lift-up needs to be sensed. With the single press ON double press OFF led indication shown at the bottom of the push button circuitry, first push of the push button leaves the led ON, a second push turns it OFF. Reminds the user which button(s) was/were pressed once. Only relevant parts of the design shown. 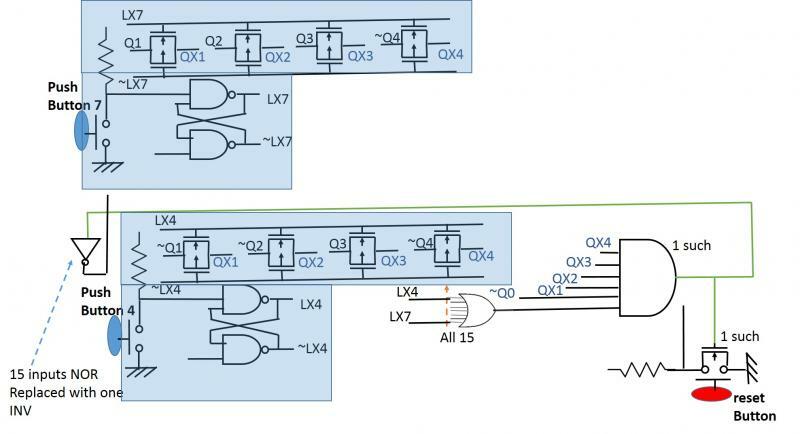 Detailed connections of the pgen follwing the scheme of Item#233, would require the LX and ~LX lines split between the flipflops Q1 - Q4 (the Qx0 can directly connect to ~Q0). So, that will need 4 pairs of transmission gates per push button. A calculation shows that while 210 FETs are reduced in the new scheme, 264 new transistors will need to be added. Hence the scheme of Item#233 is only of academic interest. 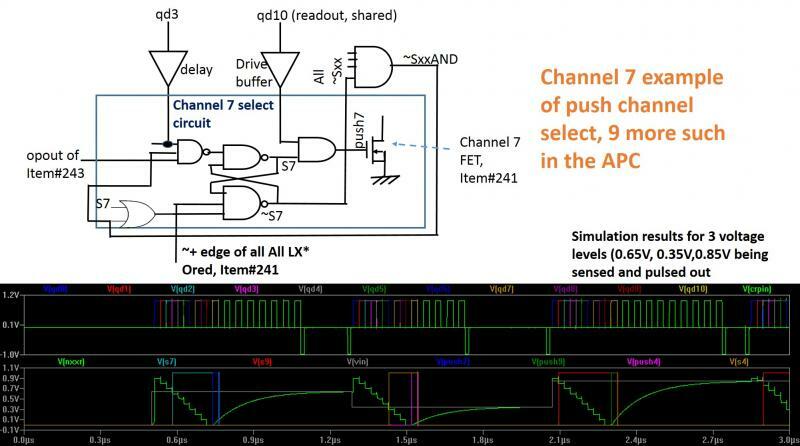 A simulation check involving two latches lx1 and lx2 getting set at different times, and a free flowing pules train on q0, shows proper output (selx) of the channel selection AND, and no leakage (except for switching currents) through the Mp and Mn FETs of the left and the right transmission gates associated with [q0, ~q0]﻿. 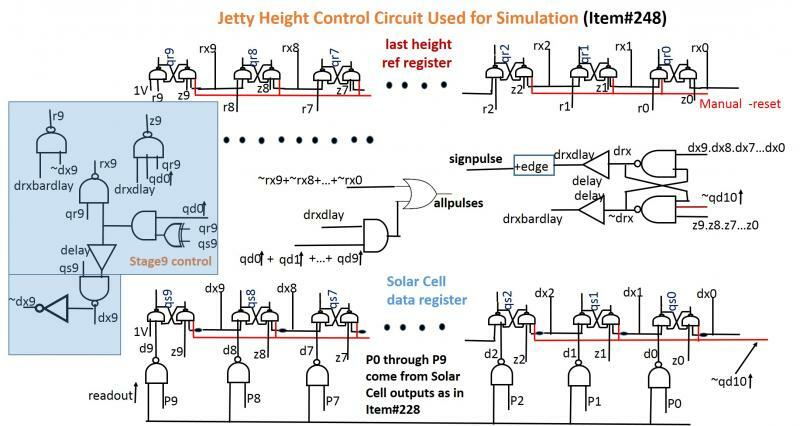 The bare-bones circuit shown above, and the simulation results shown below. When a particular latch associated with a push button is set (output of the upper NAND gate is 1), the two transmission gates next to it are ON (low resistance path), and their outputs are clearly defined (1/0). Also, X is 1, ~X is 0. Hence, the bottom transmission gates associated with [Qx, ~Qx] are all ON. Between the left and the right transmission gates associated with [Qx, ~Qx], one is clearly OFF, and the other is clearly ON, depending on the connection to their gates. This is determined by whether Qx or ~Qx needs to be fed to the channel selection AND gate, for this push button. 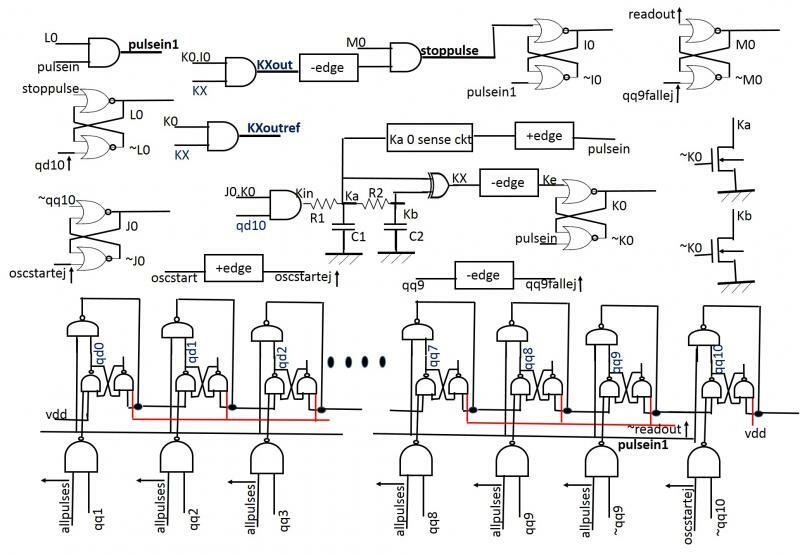 When all latches are unset (output of the upper NAND gate is 0), the two transmission gates next to it are OFF (open), and their outputs are *not* clearly defined﻿. Because of that there could be an unpredictable low resistance path between Qx and ~Qx in some situations. But, since X is 0, and ~X is 1 when the latches are all unset, the bottom transmission gates associated with [Qx, ~Qx] are all OFF - cutting off that possible low resistance path. Also, since X input to the channel selection AND gate is 0, we don't care about the other inputs. Now, why are the two transmission gates associated with each latch needed? In order to decouple an unset latch's outputs from those of another latch that may be set. Only the shaded portion is repeated for the 15 push buttons. The augmentation of the single reset pulse voltage monitor (Item#150) to the two reset pulses upgrade (Item#229) leads to a "single press ON, double press OFF" switch as shown in the following diagram. Now, by pressing the push button 4 on the pulse generator of Item#230, you can turn on the CIRCUIT 4 in the chip. Immediately press the Reset button of the pgen to release the vmon for possible activation of another circuit block, let's say, CIRCUIT 7. Again pressing the Reset button releases the vmon. So, at this time, you have activated both CIRCUIT 4 and CIRCUIT 7. You can do more if needed. A second press of the push button 4/7 followed by Reset button switches off the respective circuit block. One important advantage of the above scheme over that of Item#160 is that you can now have multiple circuit blocks simultaneously activated. 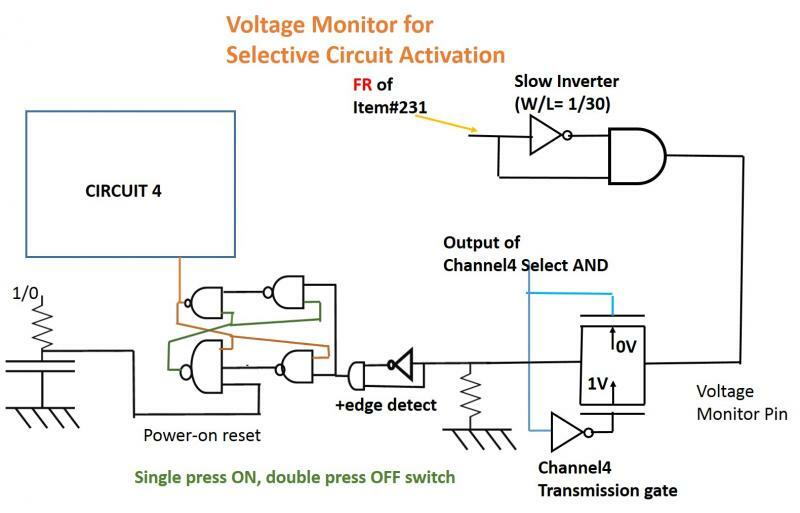 Note that the FR of Item#229 is being used to generate the ON/OFF pulse using the Slow Inverter/AND duo. The pulse is then being fed to the voltage monitor pin that transmits it through the transmission gate onto the switch for CIRCUIT 4. The next plot shows the case of the original vmon (Item#150), the instantaneous 1s of the channel selection AND gates are not suppressed for channels 2, 3, and the voltage monitor pin momentarily sees the Channel2 and Channel3 voltages. This may not be an issue for voltage monitoring purposes, but, will definitely cause problems in more general applications. 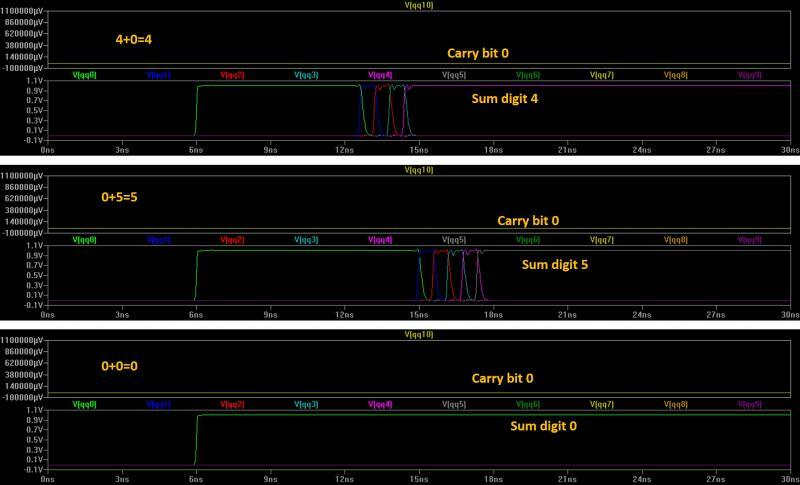 The third plot shows the result for the vmon of Item#229 using two reset pulses. There is no unwanted pick up of the Channel2 and Channel3 voltages on the way to Channel4. 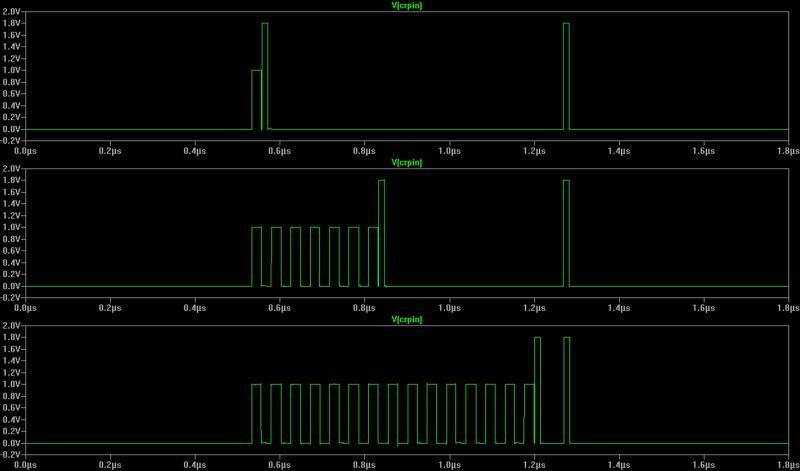 An example simulation result showing the case for channel4 pulses shown below. The first reset pulse indicating the end of the pulse train is auto generated, the second is the manual (push button) reset pulse. As discussed in Item#s 211 and 212, a pulse rectifier could flatten the pulse train into a thick pulse which (inverse of it being fed to the channel selection AND gate of the vmon) could be used to stop the instantaneous openings of the "previous" channels. But, we can avoid the pulse rectification by simply introducing a second pulse train demarcating reset pulse into the picture. 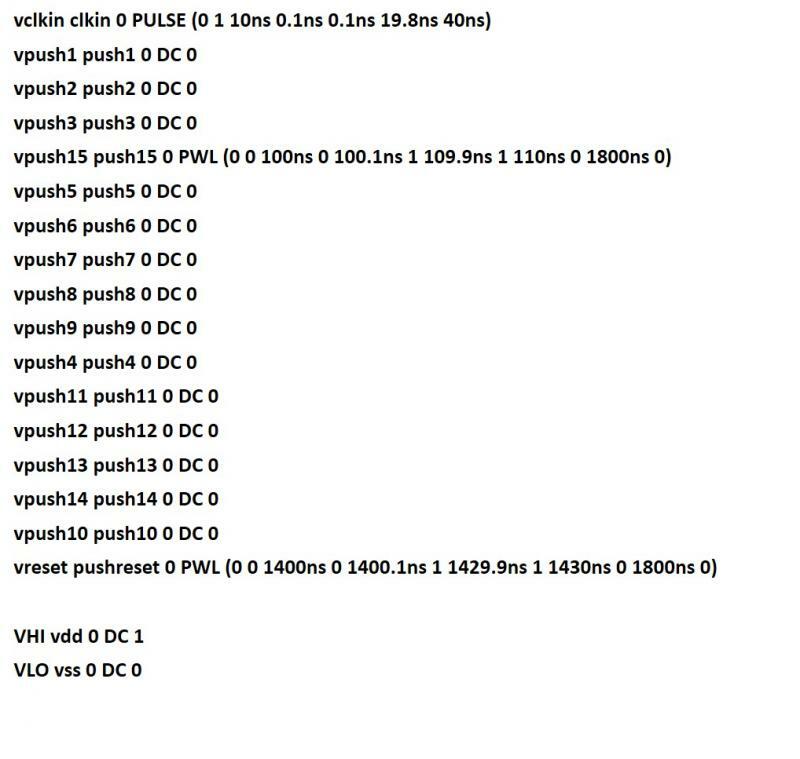 We would then use the following pulse scheme for a channel4 activation. Please note that the first reset pulse does not reach the Reset line, it just sets the latch to 1 (FR). The FR fed to the channel selection AND gate remained 0 till after the last pulse of the pulse train - so, no "previous" channels would open when favorable states were presented to their inputs as the pulses came by. We want to make sure that the FR, ~FR states do not change before the inverted reset pulse beyond the deep Nwell switch and the next inverter subsides. 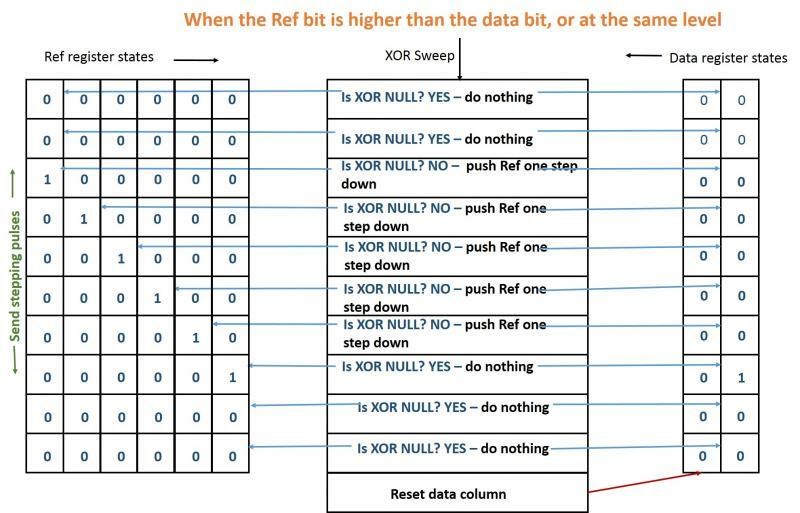 This is accomplished by first thinning the inverted reset pulse using a commonly used edge sense ckt (dynamic emulation code shown in Item#207). and then feeding them to the latch states gated NANDs - the second thinned reset pulse passing through the lower of these is inverted towards the Reset line. Next we will discuss how the pulse train demarcaing reset pulse is auto generated by an upgrade to the pgen of Item#155. 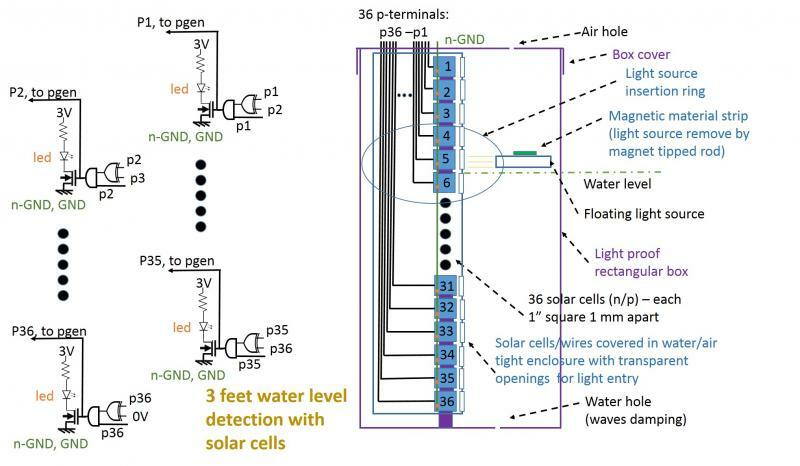 The XOR and AND gates are meant to select the lower solar cell's Voc (~0.5V) if more than one cell is activated by the floating light source. For solar cell physics, please see Item#143. 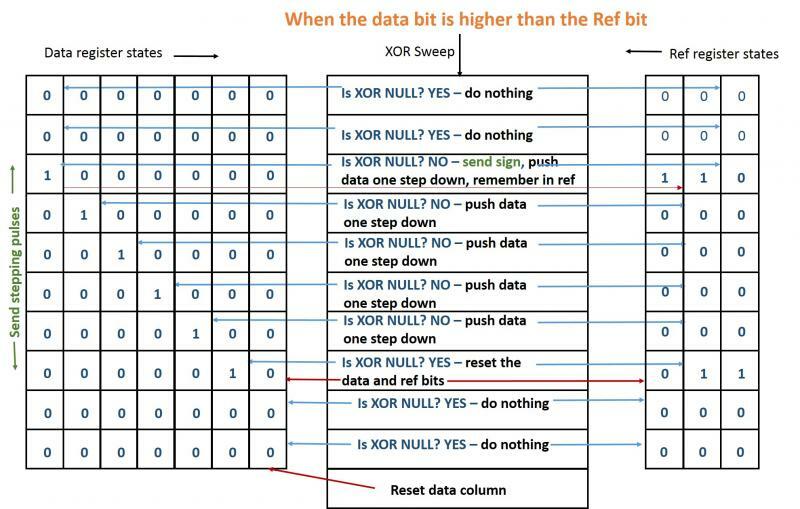 The Vth of the Nfets in the XOR, AND gates should be < Voc. 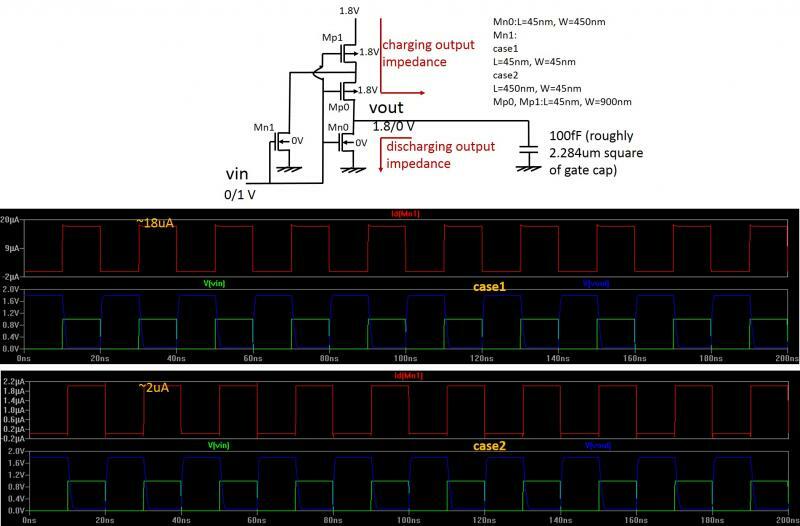 The gates can be run at 1.1V VDD. The floatable light source has the ring to help insert it on to the solar cells column. For easy removal, there is a thin magnetic strip that allows a magnet tipped rod to pull it out when the batteries die. The light proof external box has two small holes - one at the bottom for water entry, and the other at the top for air exit. This avoids any sudden disturbance to the water level inside the box due to waves in the lake. The internal enclosure containing the solar cells and the wires is heremetically sealed, and made of an opaque marerial, except for the light-entry apertures in front of the solar cells. Approximate flatboat top surface area 10x15 sq feet. When a 1500 kg car rides on the boat, the boat is pushed down into the water by 4-5 inches. The 4000 kg ballast helps keep the center of gravity of the loaded boat sufficiently below the water - needed to avoid a capsize. Note the boat's under water taper towards the ballast - this ensures sufficient underwater depth to accommodate the propeller and the rudders. The fluid dynamic nose reduces water resistance while the boat moves forward. 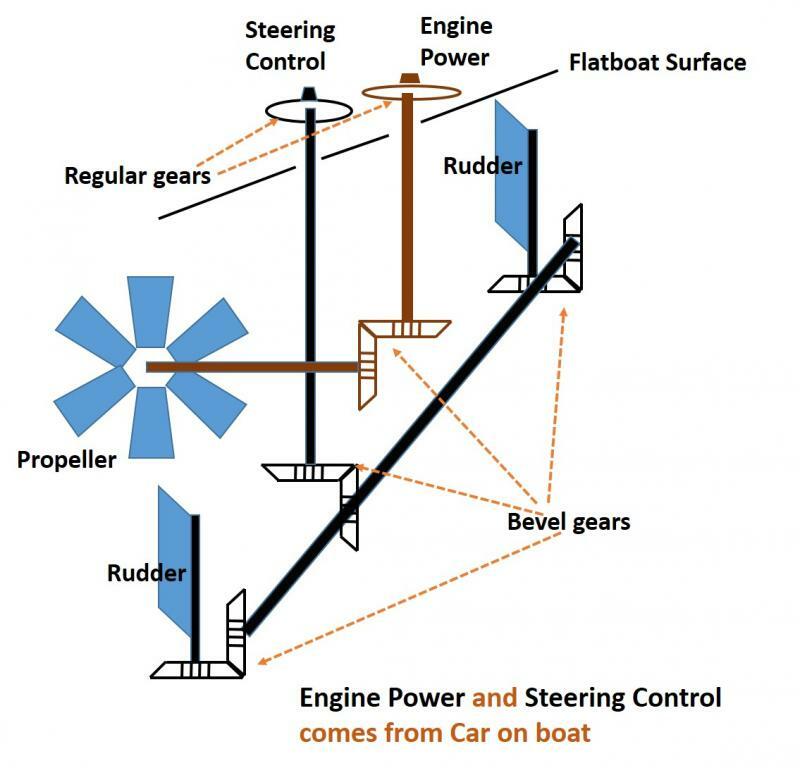 The boat's interior is empty except the propeller and rudders control mechanisms shown in Item#226. The boat is made of some light but strong material. The Jetty height above the water level must remain constant in order to ensure smooth ramping of the car into and out of the boat. The hydraulic press operated Jetty is lifted or lowered in response to the water level every hour or so. This is accomplished by the Jetty height control mechanism. 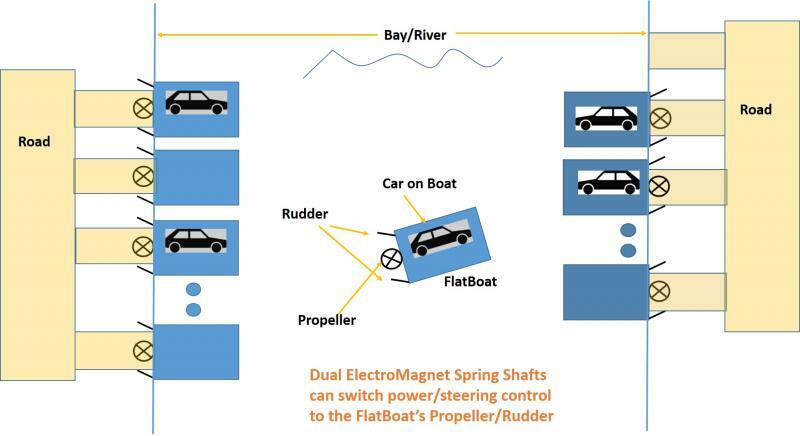 One dual electro-magnet spring shaft can help switch power from the car's wheels to the propeller and back, and another from the steering control from the car's axle to the Rudder of the boat and back. Item#224>﻿ What happens when you brake the vehicle running at, let's say, the 4th gear (refer to Item#223)? The action of braking is required to generate a pulse. This pulse can be used to take the transmission immediately to Neutral. (not shown in Item#223). This is needed to remove power from the output power chain (Item#222), and reduce load on the brakes. When the speed of the vehicle has sufficiently reduced, put it to a lower gear (1,2,3). Note from the diagram of Item#223, that you can switch to any of the foward gears from Neutral. At the time of switching to a forward gear, two possibilities exist. One, that the speed of the output chain is higher than the speed of the output pawl of the gear you are switching into. The chain will slip on the pawl until speeds become equal. Two, the chain speed is lower than the speed of the pawl. The pawl will immediately engage, and start bringing the chain to its speed. Item#223> control circuit for a press-button manual transmission based on the dual Electro-magnetic spring shaft system (Item#222) - it generates the pulses to activate the left and bottom electro-magnets. No stick shift or clutch pedal are needed for this manual transmission. 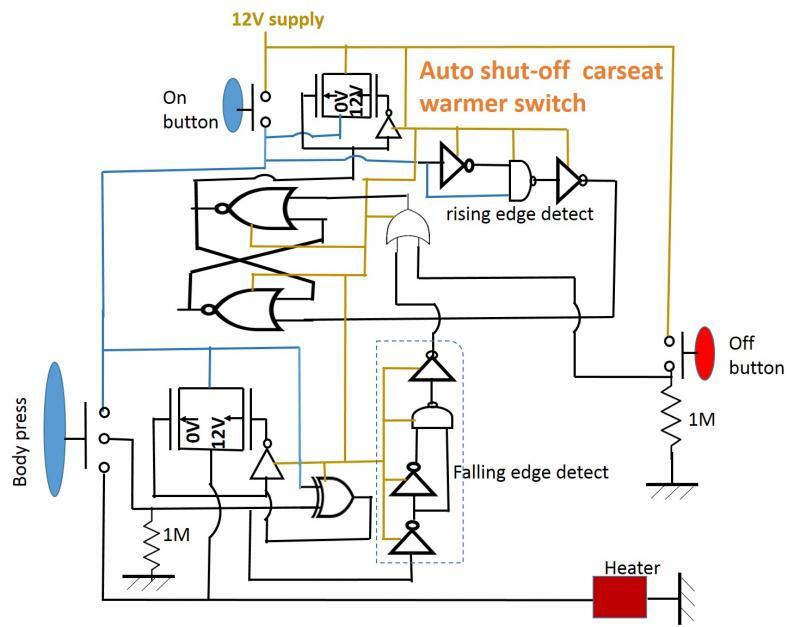 When the car is started, the car start pulse pushes the system to Neutral. You can go to Gear1 only if the previous state was zero speed, or Neutral,or Gear2. Otherwise, the Gear1 switch press will do nothing. Similarly, you can go to Gear2 only when the previous state was Gear1, Gear3, or Neutral. And, so on. 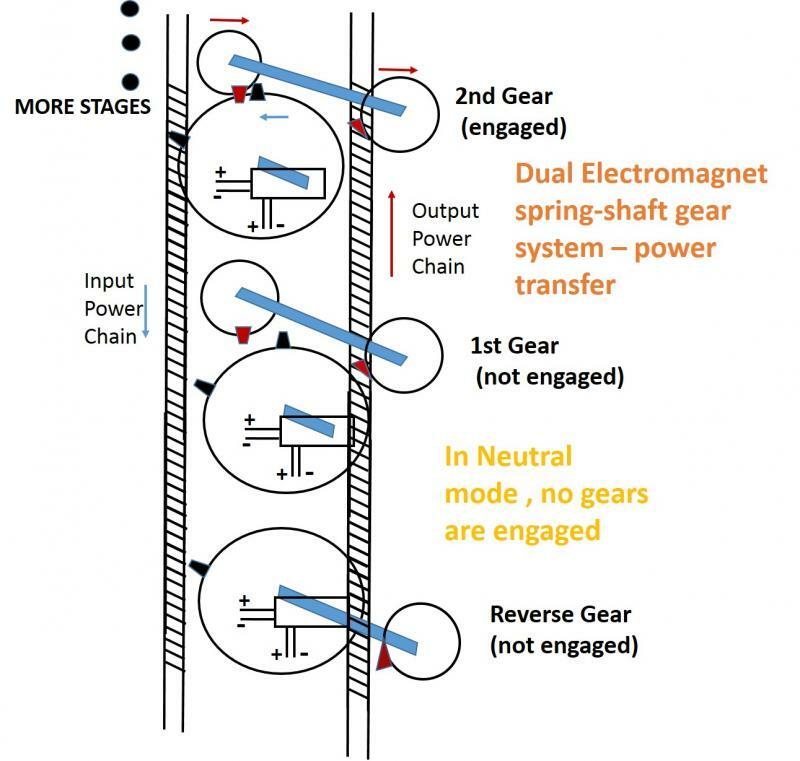 Any successful Gear press will first deactivate the previous state, and the 'led'for the new Gear state will glow. As soon as a Gear change takes place, the pulse B to energize all the bottom electro-magnets is generated using the RC circuit on top left - the second from top. The RC time constant determines the width of the pulse B which releases all Cantilevers to their ground state, by briefly pulling the Button-head rod down (Item#221). As soon as the B pulse goes to zero, the RC circuit for the C pulse starts discharging - helping generate the C pulse to activate the Gear specific Cantilever electo-magnet. But , the C pulse is fed to the Gear's electro-magnet only when B has gone to Zero - this is accomplished by the transmission gates to the right of the Gear latches (~B.GX1, ~B.GX2, etc). See that the reverse gear can only operate when the speed was Zero. When the speed goes from finite to zero, Z goes from 0 to 1 - this +edge deactivates the reverse gear. The sane +edge will also push the system to Neutral, and release the B pulse to all the bottom electro-magnets. The Neutral state is deactibvated by any successful Gear changes. Note that I have transposed the output power chain (Item#204) to the left of the output pawls, making the upward direction of the output power chain the forward drive mode. This was done to accommodate the reverse gear. One important point about the ﻿reverse mode operation is that all the unpowered forward pawl shafts will﻿ rotate, as pulled by the downard moving output chain. But, that's okay - because they are unpowered. In the above diagram, the 2nd gear is shown engaged, all others are off. Note that a bevel is added to the bottom side of the cantilever's electromagnet end. 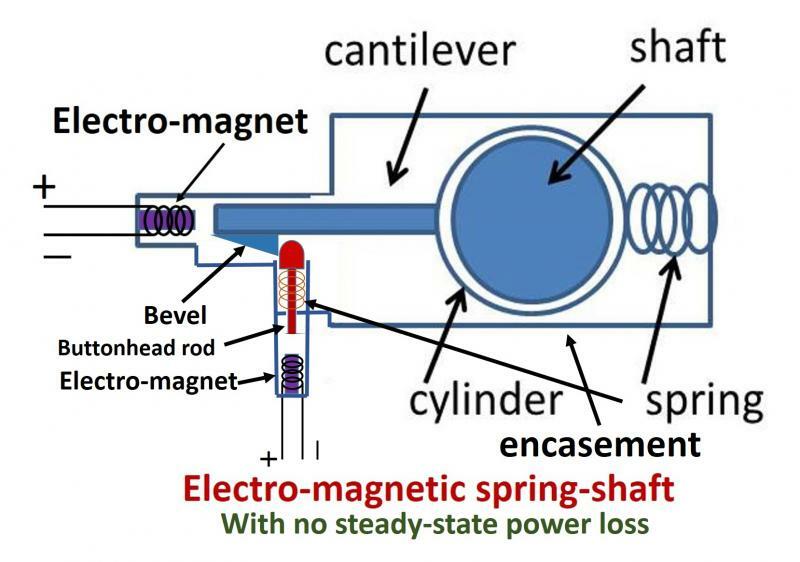 When the electromagnet gets an electric pulse, it pulls the cantilever, and the bevel pushes the buttonhead of the spring added buttonhead rod down and beyond it. Immediately, the buttonhead moves up and holds the bevel from returning. This is smilar to how the runner on an umbrella pole is kept from moving down by the top spring. At the time of release, the bottom electromagnet is energized wih a pulse, the butonhead rod is pulled down, instantly releasing the bevel enhanced cantilever. One way to avoid creating a new text layer (726) and deleting all other text readins/attach in the deck is to create a dummy cover cell (probably, with calibreDRV) and instantiate the FullChip under it at (0,0). Now call the dummy cover cell FullChip_cover. In the bump text file, change the cell name of the top cell to FullChip_cover. as before. Note that the dummy cover cell pushes down all text except for the APRDL texting as in the bump text file. So, all non-bump text turns out to be lower level text now, for LVS. 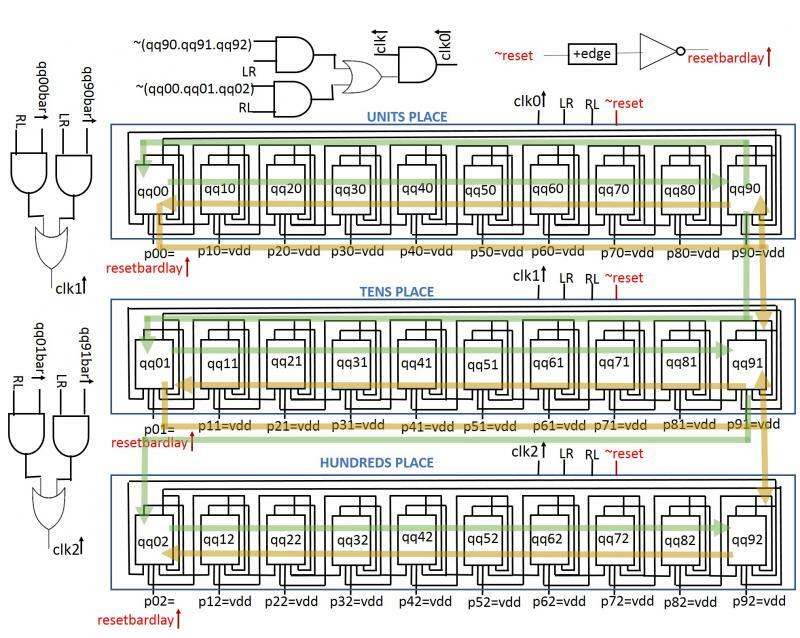 One important thing to note is that at fullchip LVS time, any top level (of hierarchy) texting on the chip represents an electrical connection from outside. So, reading in any top texting other than bump text means you are not modeling it correctly. Because the probe package can only probe the APRDL through the BO! If the connection model is incorrect, the LVS results are not reliable. The concept of logically energizing and deenergizing parallel electrical connections using mechanical spring connect buttons can be useful in other situations too.﻿ Detailed simulation yet to be done. This "code snippets2" page is a continuation of the "code snippets" page.